Glass Works Auctions has a wonderful example of a figural Plows Sherry Bitters in their upcoming ‘Colors of Spring’ Catalog Auction #130. 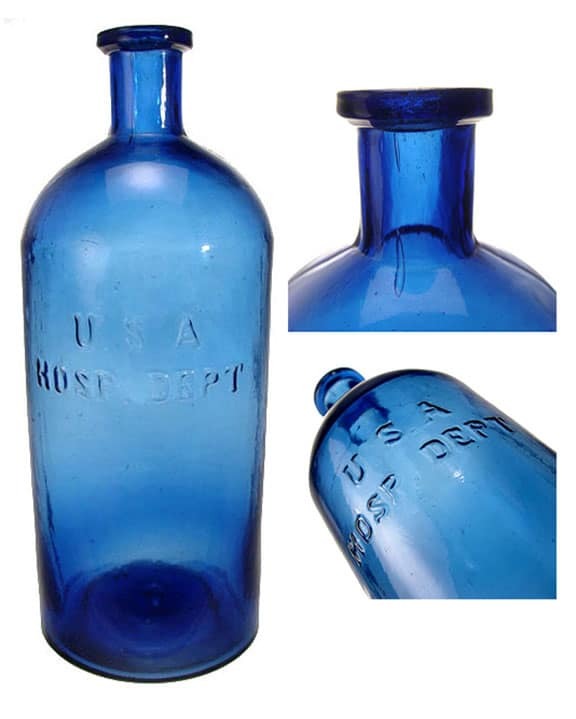 The bottle is pictured at the top of the post, in the grouping above and below. The Plows, in the form of a cluster of grapes, is drop-dead gorgeous. Even the label panel on the reverse is shaped like a grape leaf. The auction opens for bid on April 22nd and closes on April 29th, 2019. Label panel is shaped like a grape leaf. 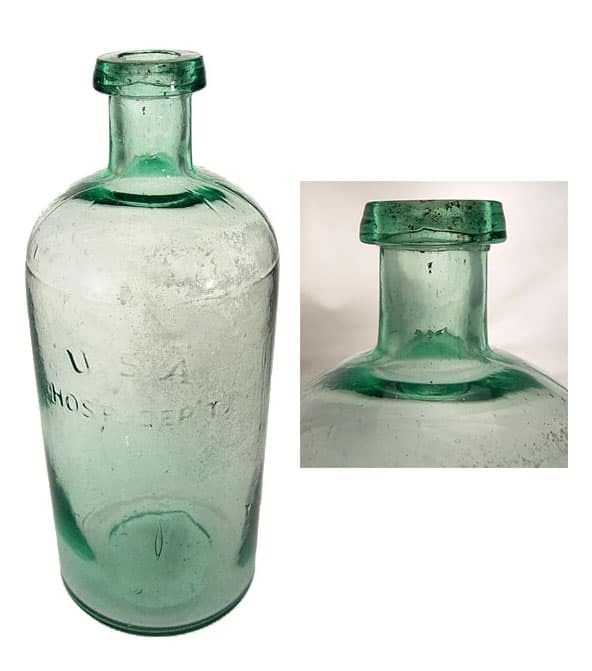 Notice that the listing above and the embossing on the bottle has no proprietor or manufacturer name, nor a city where it was produced. The copy simply says ‘Plow’s Sherry Bitters.’ There is no Plows advertising, no surviving label, no trade cards, nothing. 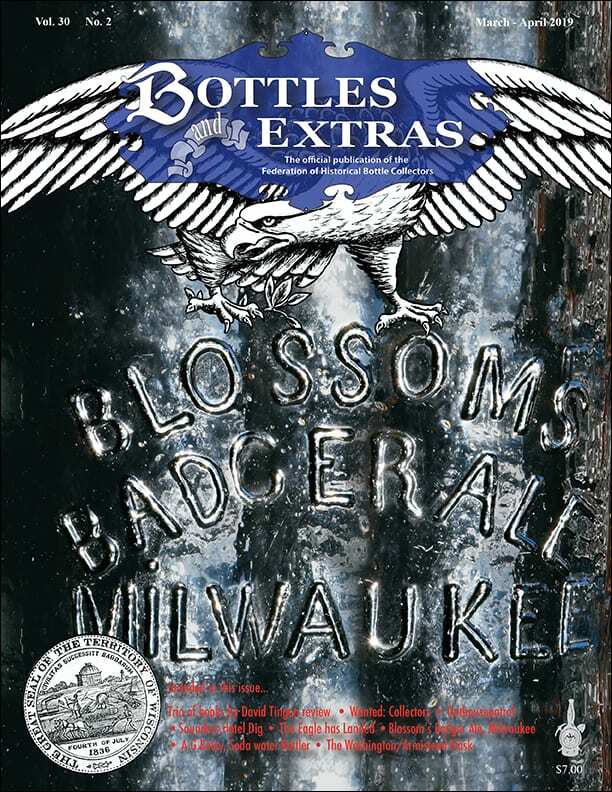 We all wondered about this bottle until the 1st Chicago Bottle Club cracked the case and posted the following advertisement on their web site. This little ad had it all. Oh, here is my example pictured below. I love the amber coloration which changes throughout the bottle. 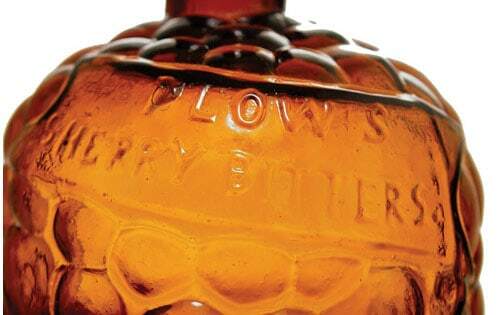 The Plows bottles only come in amber, so no color runs here. 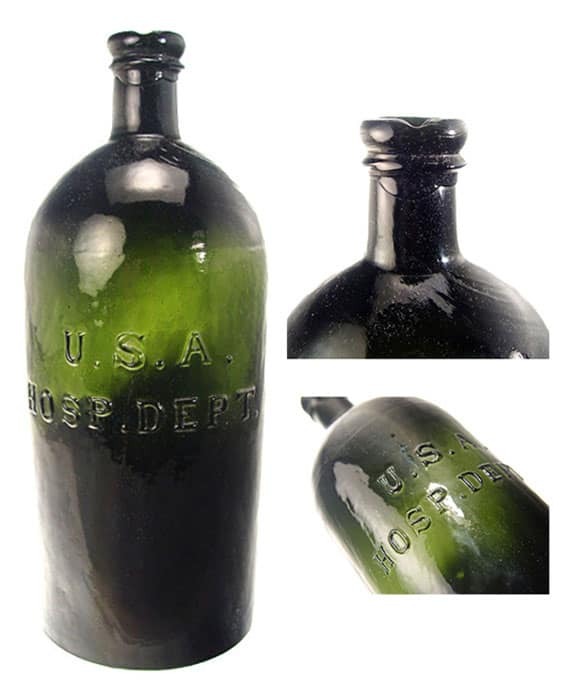 This example came from American Bottle Auctions, Grapentine I Auction in April 2007. 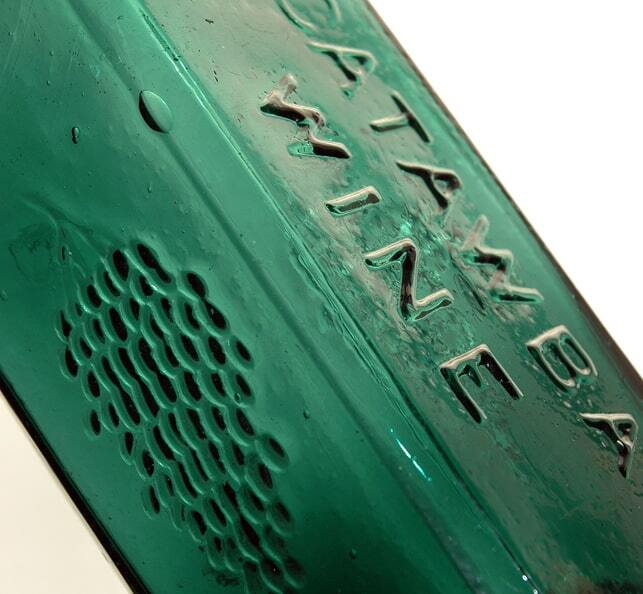 It was previously auctioned by Glass Works Auctions in Auction #48 and noted as ex: Frank Barranco. It has a drippy top, loads of whittle and is a top specimen. There is not a terrible amount of information about W. A. Plows. We know that he was born in New York around 1831. In 1855, he was living in New York with his wife Olivia and one child according to the New York State Census. Five years later, an 1860 United States Federal Census lists him working in a saloon in Milwaukee. William J. and his wife are listed with three children, Olivia age 6, Edward age 4 and Gertrude age 2. William J. Plows leaves Milwaukee and is next found in Chicago in 1866 where he is a partner at Smith & Plows. 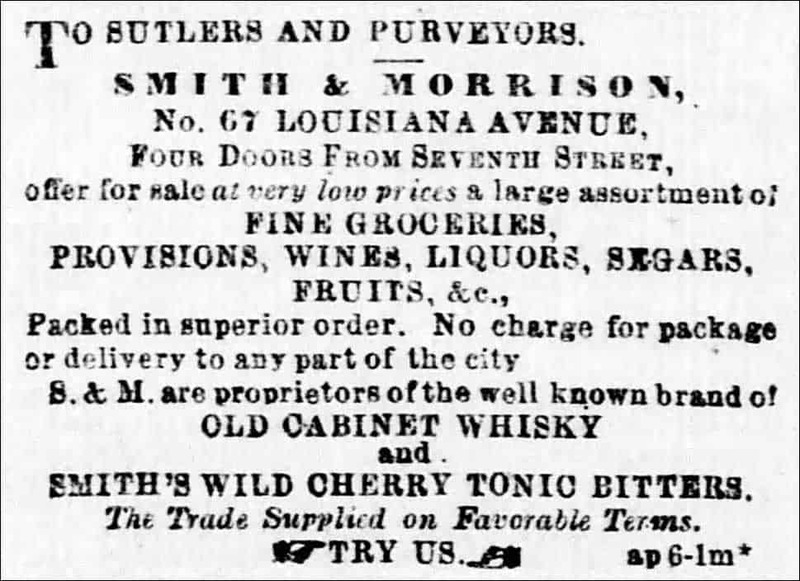 William J. and Charles R. Smith are selling wholesale wines and liquors at 103 S. Water Street. 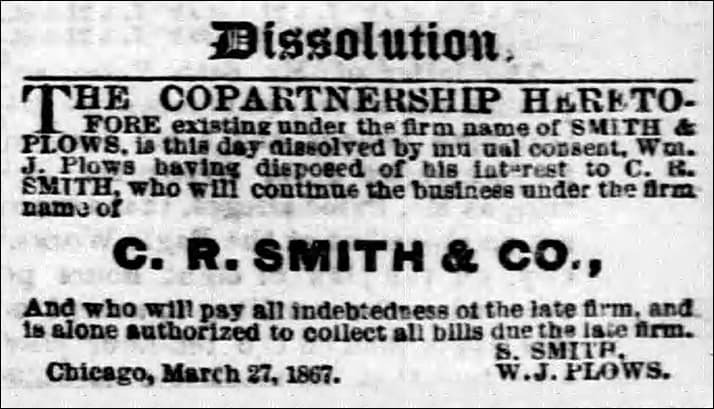 This partnership ended on March 27, 1867 according to the Chicago Tribune. Plows left while leaving C. R. Smith & Co. to continue with the liquor business. He might have been bought out leaving him some money to finance Plows Sherry Bitters. Plows must have, in quick order, gone into business with William D. Harris & B. H. Upham as Plows, Harris & Upham is listed in 1867 as liquor dealers located 72 Randolph according to John C. W. Bailey’s Business Directory of Chicago. 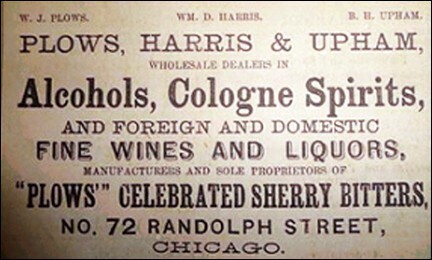 This is pretty much the same information on the ad posted by the 1st Chicago Bottle Club except their ad also notes that Plows, Harris & Upham were Wholesale Dealers in Alcohols, Cologne Spirits and Foreign and Domestic Liquors and that they were the Manufacturers and Sole Proprietors of “Plows” Celebrated Sherry Bitters. 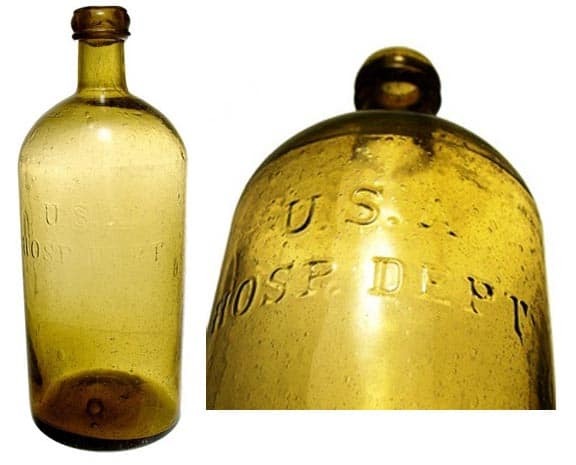 The bottle was probably ordered only once in a group and sold wholesale and retail in 1867. This partnership would end as Plows is next listed as a partner with Plows, Abel & Humiston (William J. Plows, John Abel and Len S. Humiston) who were liquor dealers located at 154 Dearborn. They were listed in 1867 and 1868. There is some overlap here as Plows must have had a few irons in the stove. A newspaper Dissolution notice for Plows, Abel & Humiston occurred as of April 20, 1869. The notice said that W. J. Plows would continue the wholesale liquor business at 154 Dearborn. 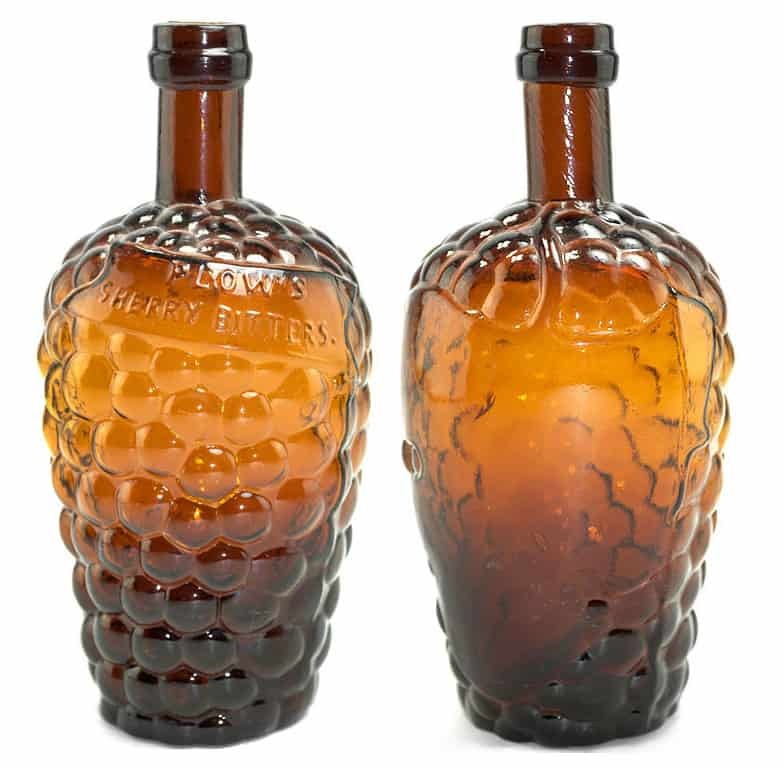 Bitters collectors might be familar with the names John Abel and Len S. Humiston as they put out Mountain Root Bitters. 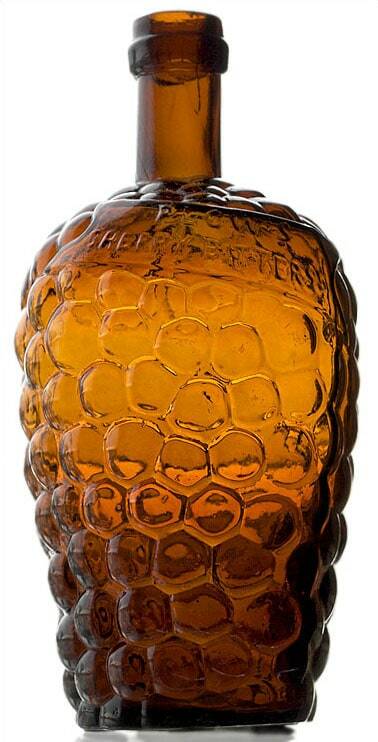 Read: Abel, Humiston & Co.’s Mountain Root Bitters! In 1869, W. J. Plows put out notices that he was wanting to sell his old wholesale liquor business cheap so he could go into distilling and rectifying. The 1870 Federal Census lists him as a distiller and all other available listings after this date note that Plows was in the distilling business. His son Edward would join him as a clerk and accountant. 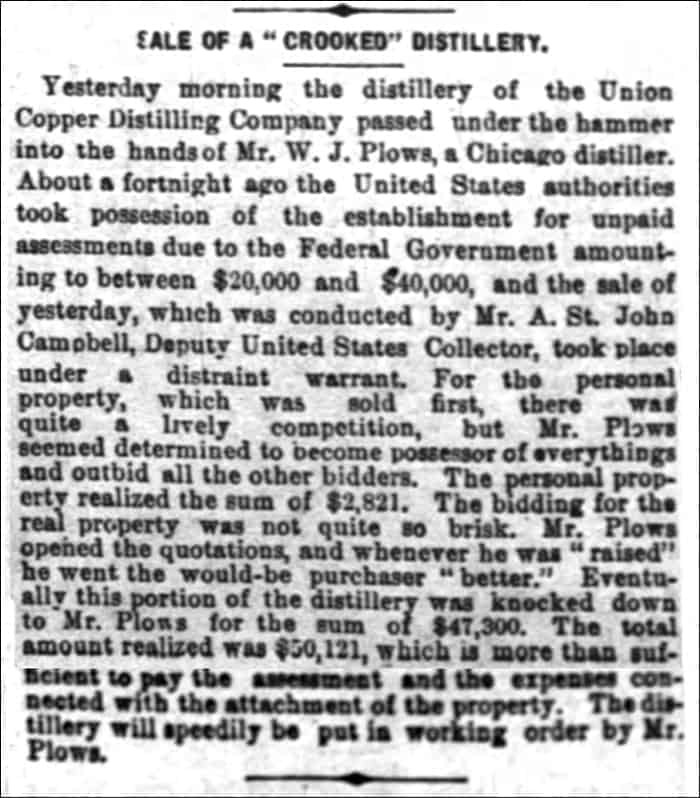 In 1875, Plows buys, at a government auction, the distillery of the Union Copper Distilling Company. In 1878, William J. Plows is listed as the Proprietor of Vienna Coffee located at 65 Dearborn with a residence in Zurich. I guess that these were his golden pasture years. 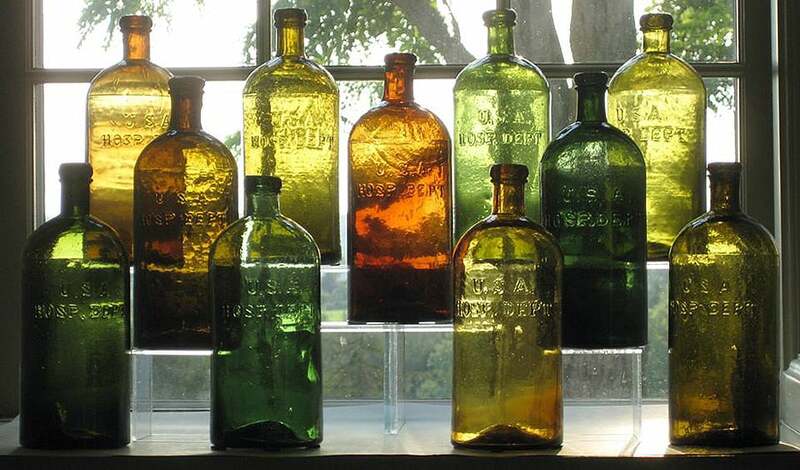 Plows would die in the early 1880s leaving his wife a widow and antique bottle collectors with a great bottle. 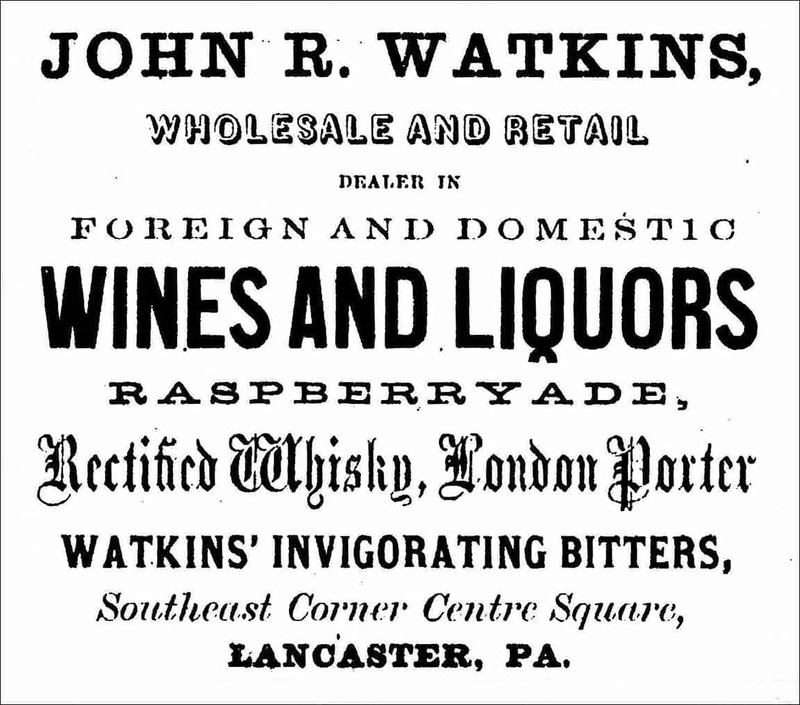 I’ve had tucked away and stored in a digital folder, the upper-most advertisement for John R. Watkins, Agent, Wholesale and Retail Dealer in Foreign and Domestic Wines and Liquors, Raspberryade, Rectified Whiskey and Watkins’ Celebrated Bitters, &c. Watkins was located on the southeast corner of Centre Square in Lancaster, Pennsylvania. 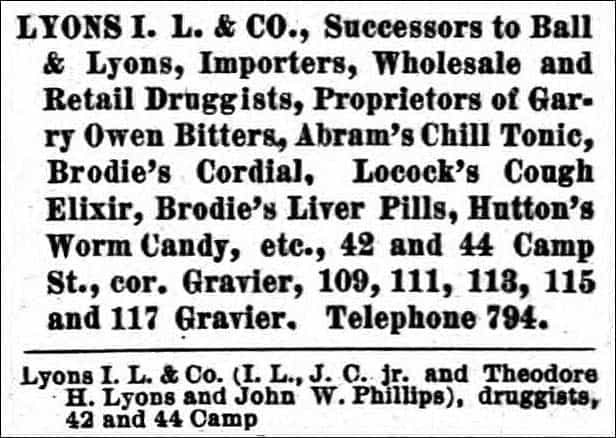 The advertisement was found in the 1867 Directory of Lancaster County. I’m not familiar with this bitters and I’ve certainly never seen a bottle. Here is an odd listing within the first Carlyn Ring and W.C. Ham Bitters Bottles book for another J. R. Watkins bitters bottle. I see no connection. The listing may want to be updated in Bitters Bottles Supplement 2. J.R. Watkins Company, from ocean to ocean. 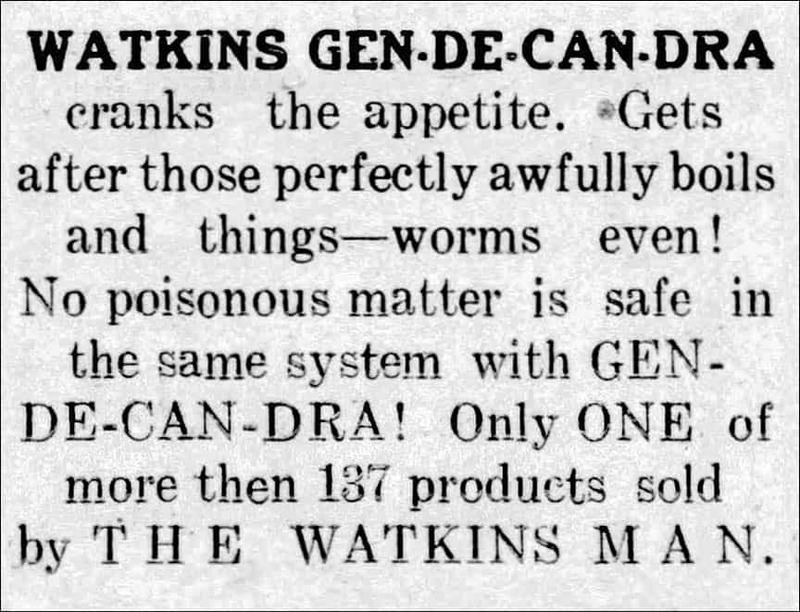 Gen-De-Can-Dra Manufactured only by the J.R. Watkins Medical Company, Proprietors of Dr. Ward’s Remedies, Winona, Minn. 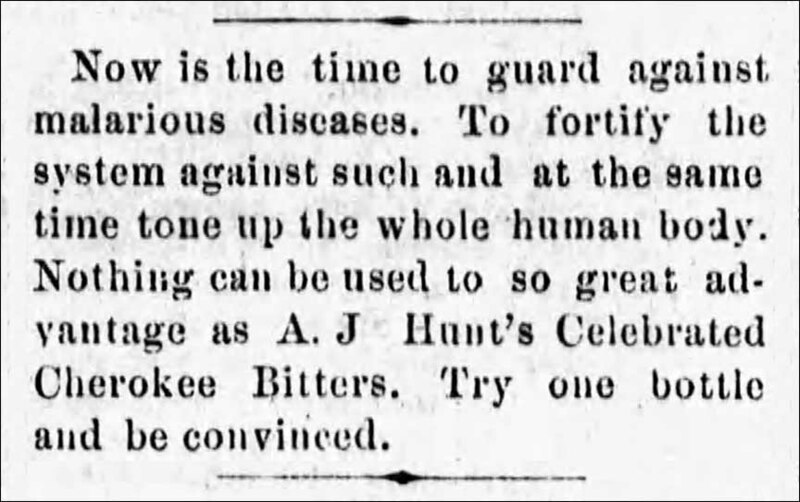 This advertisement below from the Reading Times 0n Tuesday, December 22, 1868, titled “Health! The Greatest Blessing!” Notice that the bitters is now called Watkins Invigorating Bitters. 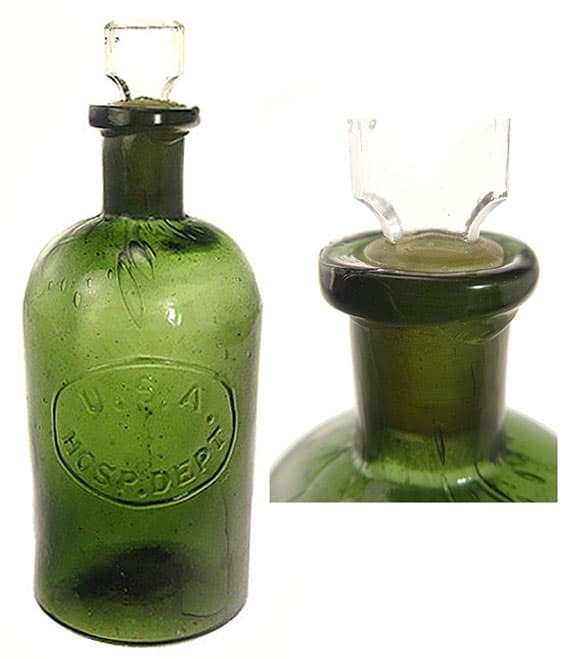 As typical for most bitters of this time period, the product is touted as being a cure-all for just about everything. 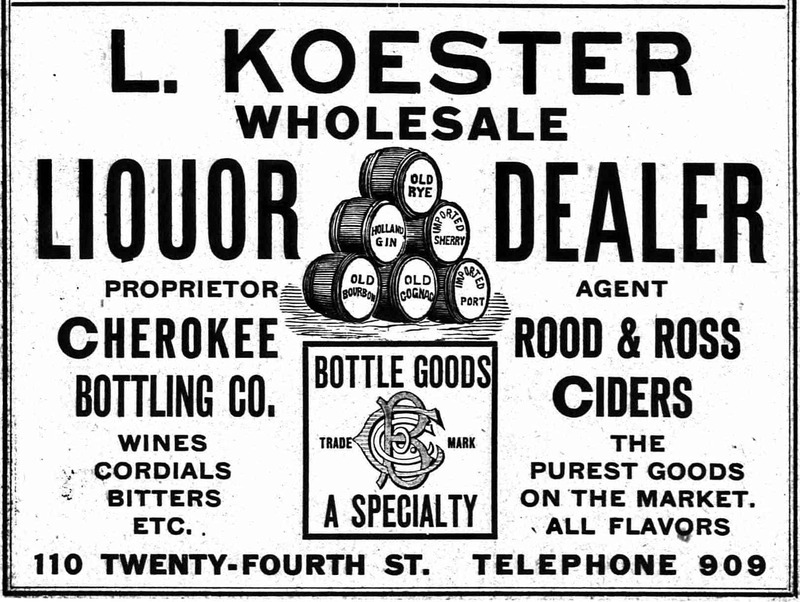 The product is again sold wholesale and retail by John R. Watkins, who is noted as being associated with his wine, liquor and porter establishment at Centre Square in Lancaster, Pennsylvania. From 1863 to about 1969, John R. Watkins was located on the southeast corner of Centre Square (now Penn Square) and Soldiers Monument in Lancaster, Pennsylvania. The Soldiers and Sailors Monument is a 43-foot tall Gothic Revival memorial which stands in Penn Square in downtown Lancaster, Pennsylvania. 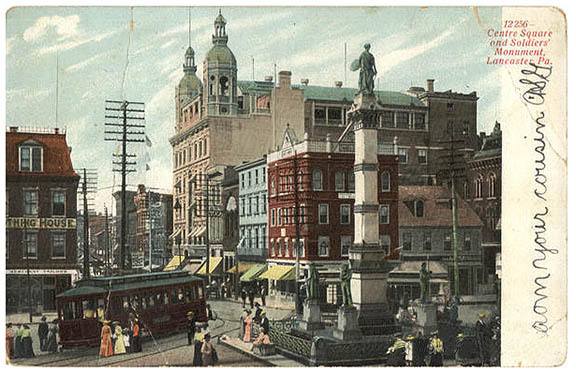 It was dedicated on July 4, 1874, at its present site on the northeast intersection of King and Queen Streets. The monument’s original intention was to pay tribute to Lancaster Union soldiers killed during the American Civil War. However, today the Soldiers and Sailors Monument also represents those who have served in subsequent American military conflicts. 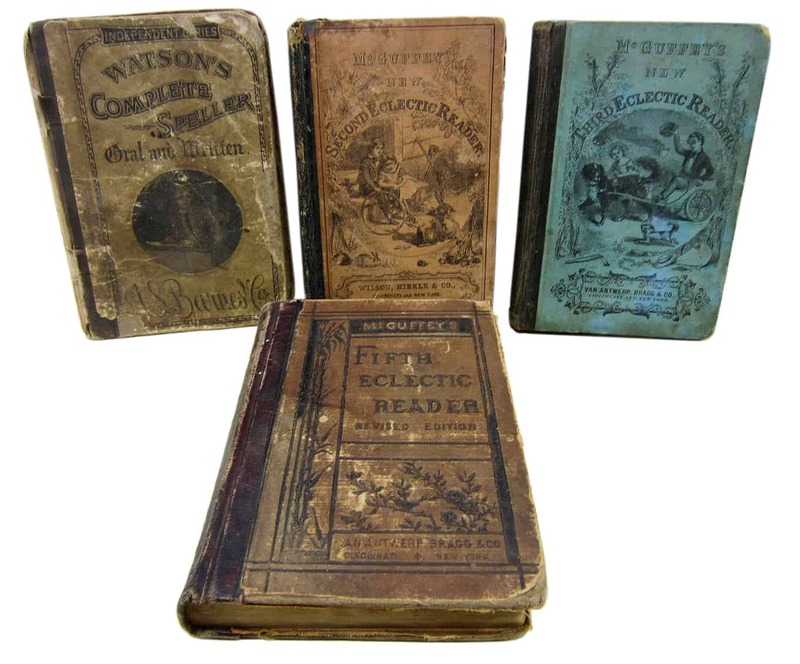 John R. Watkins was born on October 7, 1822 in Wales, Great Britain. He was married in Lancaster, Pennsylvania on November 10, 1853 to Margaret A. Kendig. 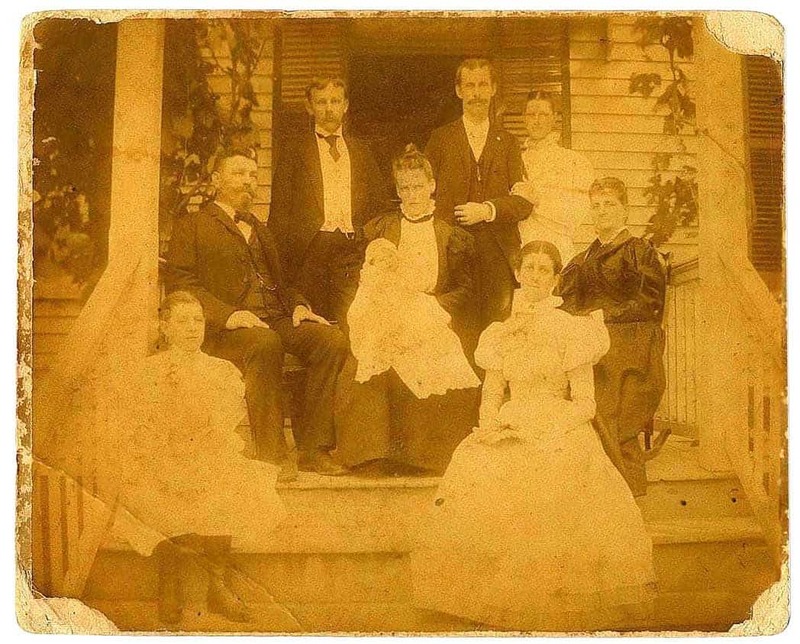 Their household occupants (besides husband and wife) that were listed in the 1860 United States Federal Census were Anna L. Watkins, Ruth Watkins, John F. Watkins, Philip K. Watkins, Isaac M. Watkins, William J. W. Watkins and John R. Watkins. Though records are scarce, we see that on February 21, 1857, Watkins was appointed U.S. Postmaster for Lancaster, Pennsylvania. By 1860, the United States Federal Census lists his occupation as an Innkeeper. 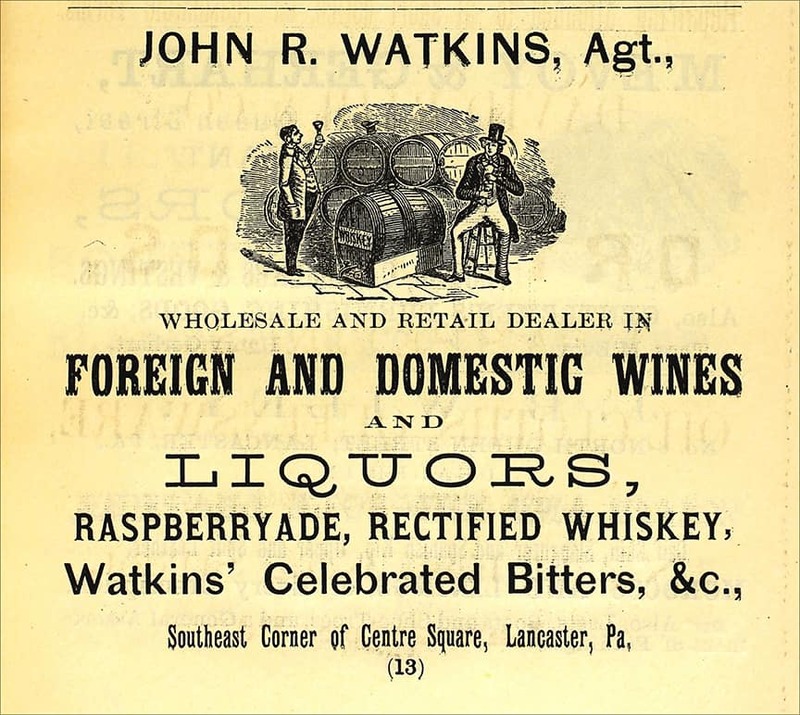 In the 1863, 1864 Gopsill´s Directory of Lancaster, Harrisburg, Lebanon and York, Pennsylvania we see John R. Watkins selling Liquors at Centre Square. He is living at 178 N. Queen. Both addresses in Lancaster. 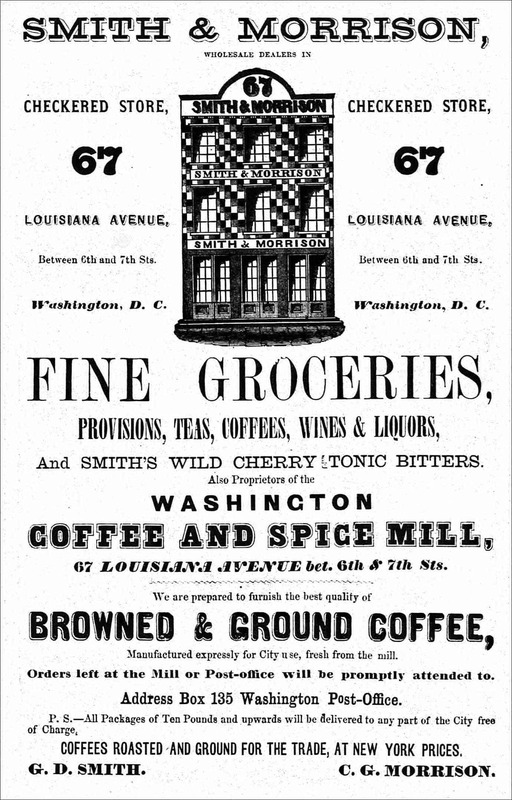 In 1867, we see his first advertisements for Watkin’s Invigorating Bitters and Watkin’s Celebrated Bitters. These were the same brand. 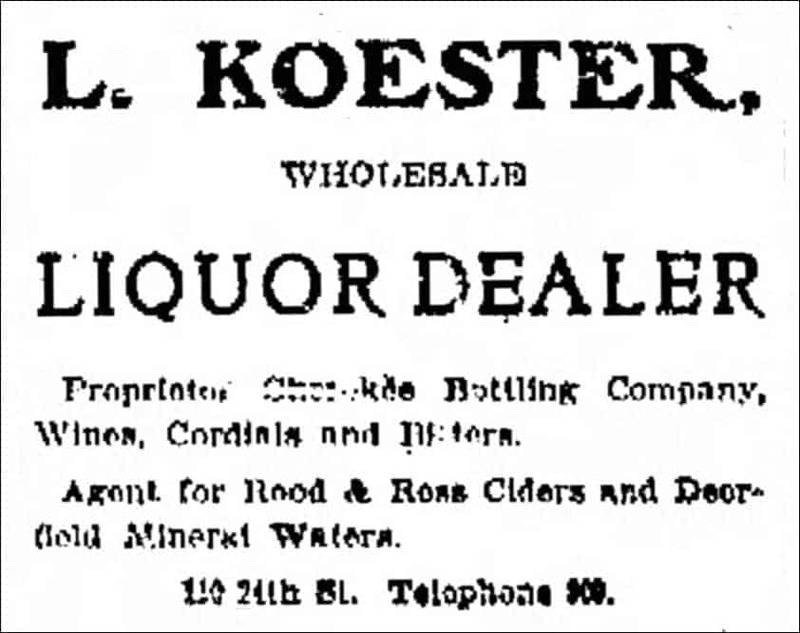 That same year, “Watkins purchased the bottling establishment of Mr. Mishler and is now engaged in bottling.” according to the Reading Times. 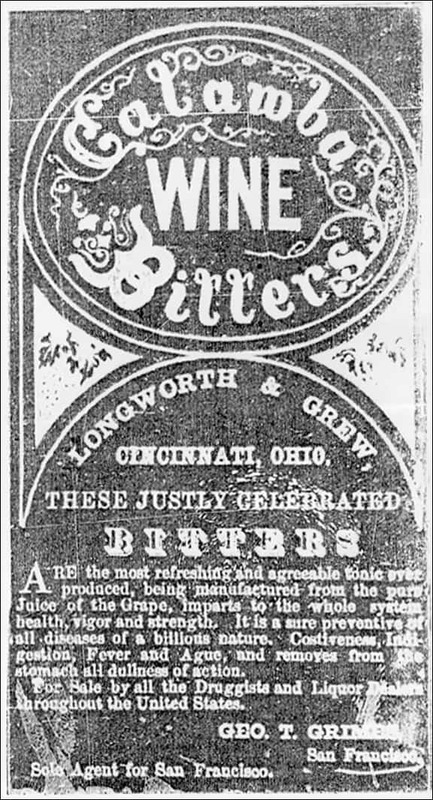 He would continue advertising the bitters in 1868 and stop in 1869. 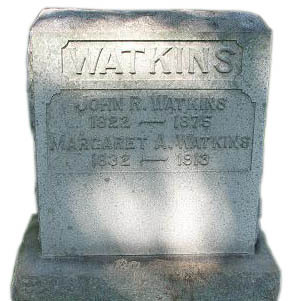 Watkins would die in 1875. 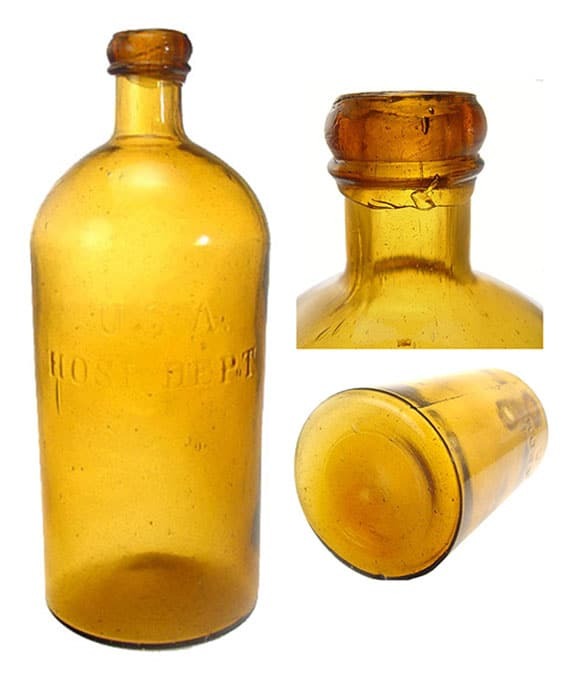 Bill Ham emailed me with a new bitters listing regarding a bottle on eBay that closed last night. 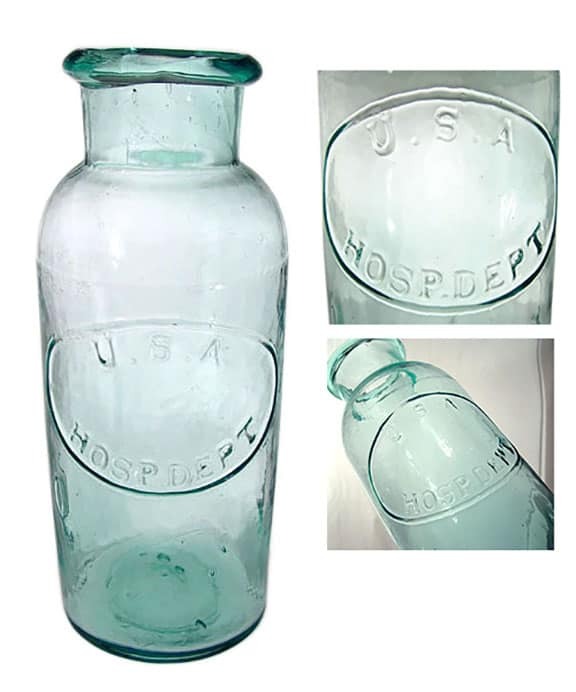 See Listing He already assigned the bottle a catalog number which is represented further below. It always amazes me when one of these unlisted bitters shows up. 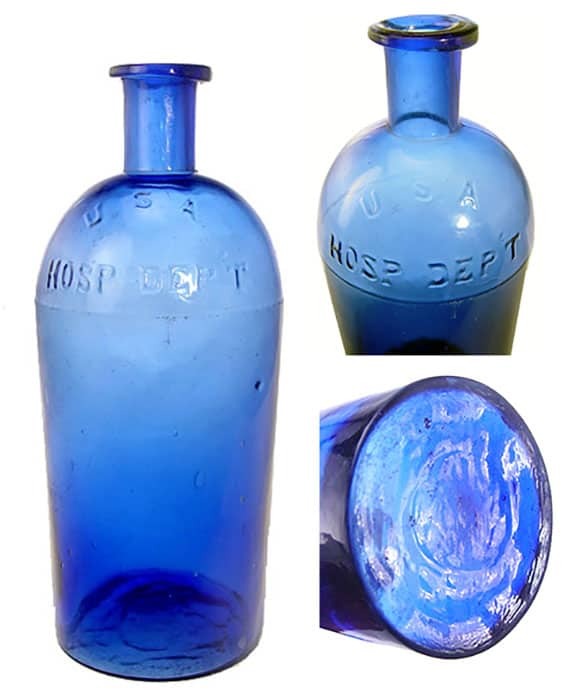 I wonder why it took so long for an example to surface and if there is any information regarding the bottle. This one took me on a wild goose chase. 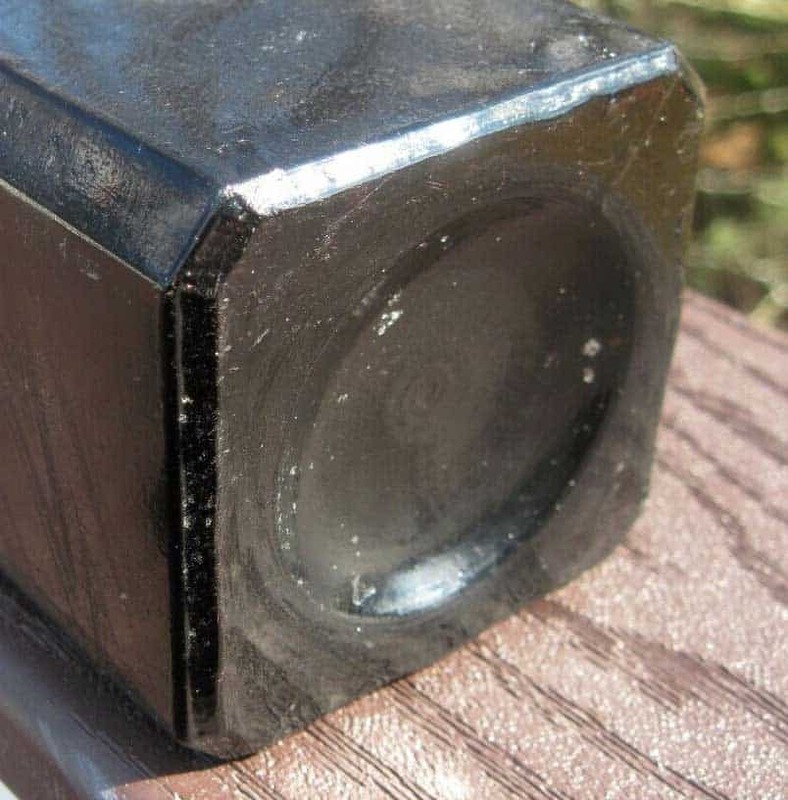 Ebay Description: Here is a square bitters bottle unlisted in Ring & Ham and any other sources I could find. It is nearly 9” tall with an applied top. 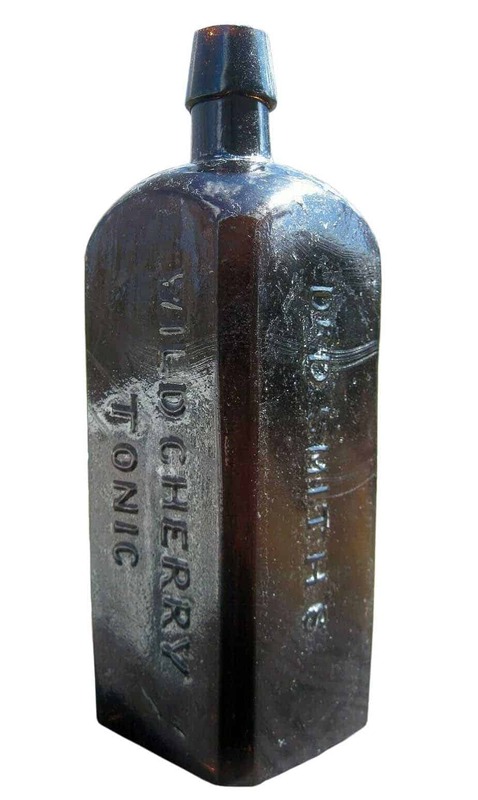 It is embossed on three sides: DR. D. SMITH’S // WILD CHERRY / TONIC // BITTERS. It displays well, but at one time the entire neck was broken off and there was a large chip on the side of the lip which was glued back on. You can see this when I used a flash in pictures #6 & #9. There was also a coating on the bottle, but I removed most of it. Not in great condition obviously, but a rare one nonetheless! 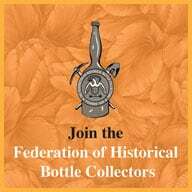 Please see my other bottles, many of them rare, which will also close on Wednesday, March 27th, 2019. So who is this Dr. D. Smith? 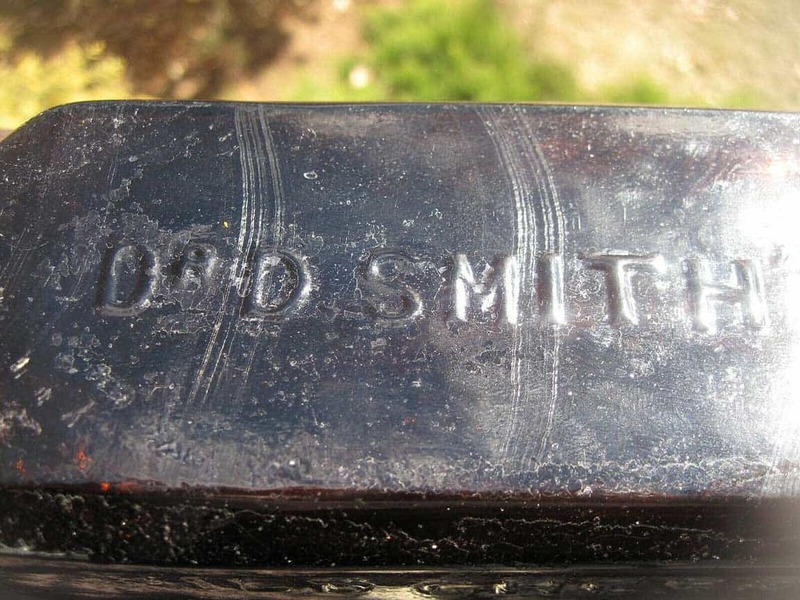 I’ve written about a few Dr. Smith’s before who were associated with bitters. This includes Dr. A.H. Smiths Old Style Bitters, Smith’s Gentian, Dandelion and Yellow Dock Bitters, and Dr. Smith’s Magic Bitters. 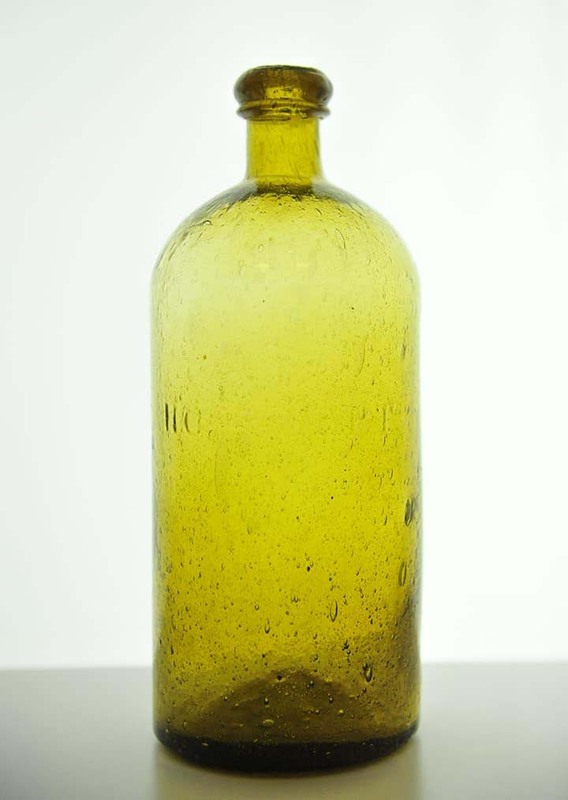 I do not think our subject eBay bottle is related. As you might expect, there are a number of other Dr. Smith Bitters listings in Bitters Bottles which include S 120: Smith’s Bitters (N. K. Brown, Montpelier, Vermont), S 121: Dr. C. H. Smith’s American Stomach Bitters from Albany, New York, S 122.5: Smith’s Celebrated Stomach Bitters (B. Smith, Hyde Park, Pennsylvania), S 122.7: G. M. Smith’s Celebrated Club House Bitters, S 123: L…Dr. Smiths Colombo Tonic Bitters (Benjamin Smith, Scranton, Pennsylvania), S 124: Smith’s Druid Bitters, S 125: L…Smith’s Green Mountain Bitters (Dr. J. H. Smith, St. Johnsbury, Vermont), S 125.5: H. Smith Iron & Quinine Bitters from Dedham, Massachusetts, S 126: Dr. Smith’s Ne Plus Ultra Elixir of Life Bitters, S 128: Dr. M. Smiths Stomach Bitters from Louisville, Kentucky, S 129: Smith’s Tonic Bitters (Smith & Rundle, New Orleans, Louisiana), S 130: Smith’s Vegetable Hungarian Bitters, S 131: Smith’s Verbena Bitters (Dr. E. W. Smith, Espyville, Pennsylvania), S 132 and Smith’s Vitalizer Bitters. None of these bitters seem to be relevant. 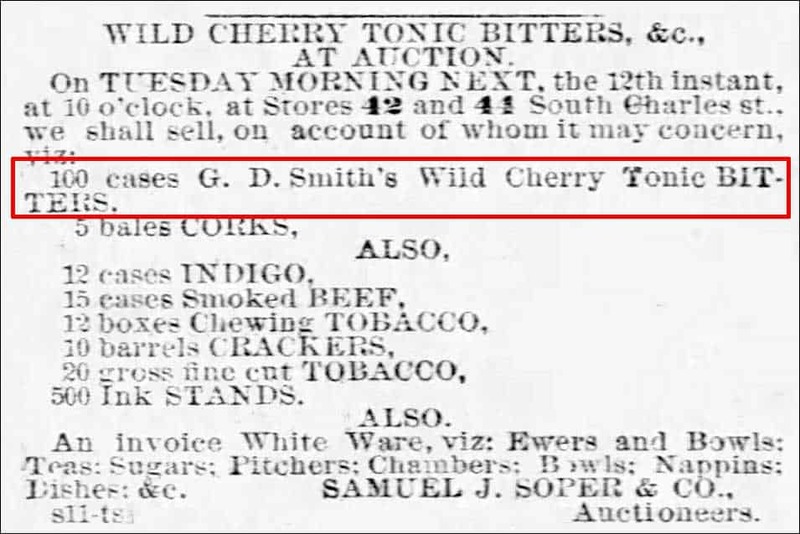 Interesting that there is a brief listing for a S 133 Dr. Smith’s Wild Cherry Bitters. Could this be our bottle? It might be a reference to the Smith & Morrison bitters featured at the bottom of this post. There are actually a few other obscure Dr. Smith Bitters out there. 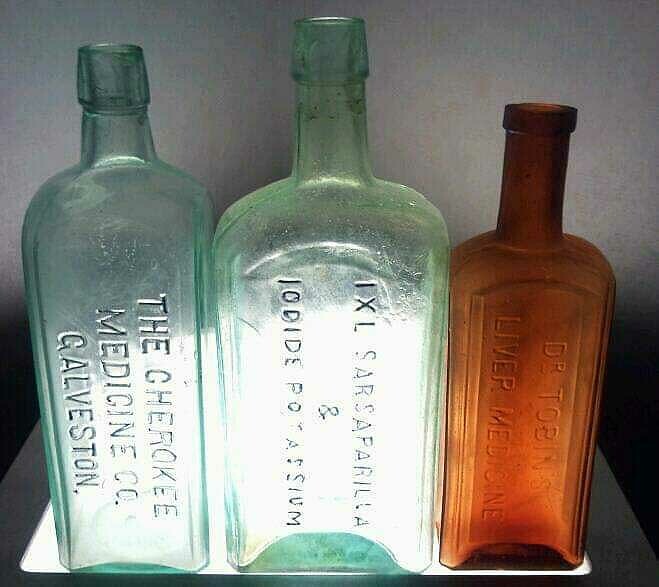 This includes Dr. Smith’s Indian Bitters put out by Charles Richardson, Chemist, Wellgate Laboratory in Dundee, Scotland. 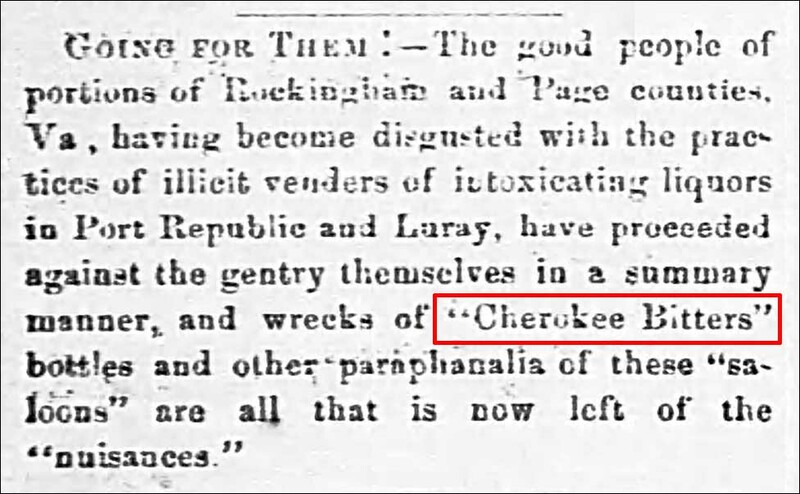 The newspaper clipping below is from The Courier and Argus, August 12, 1876. Obviously not our Dr. D. Smith. This bitters appears to be unlisted. 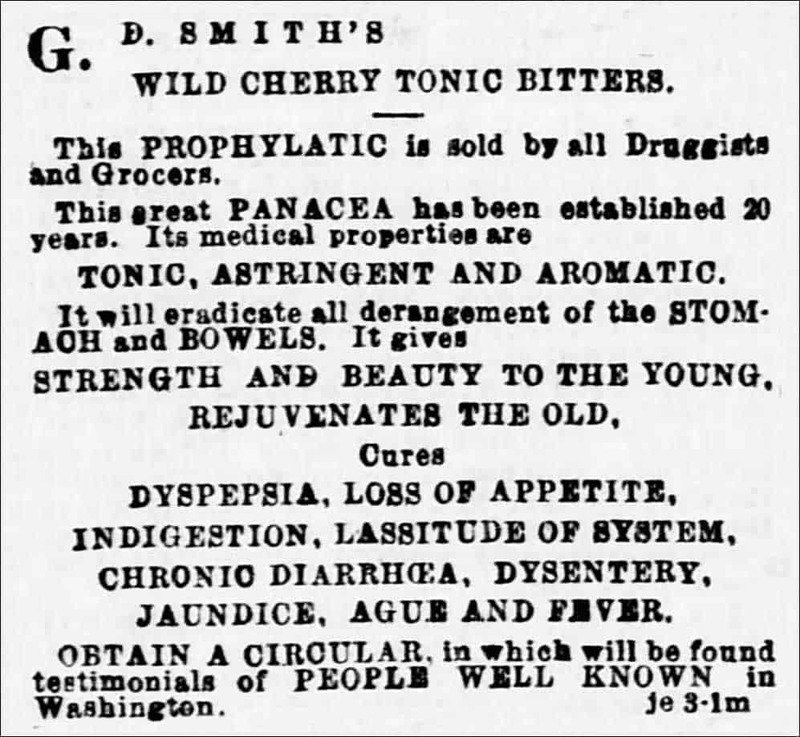 The next Dr. Smith’s Bitters reference (below) comes from the The Times Tribune on March 8, 1900. 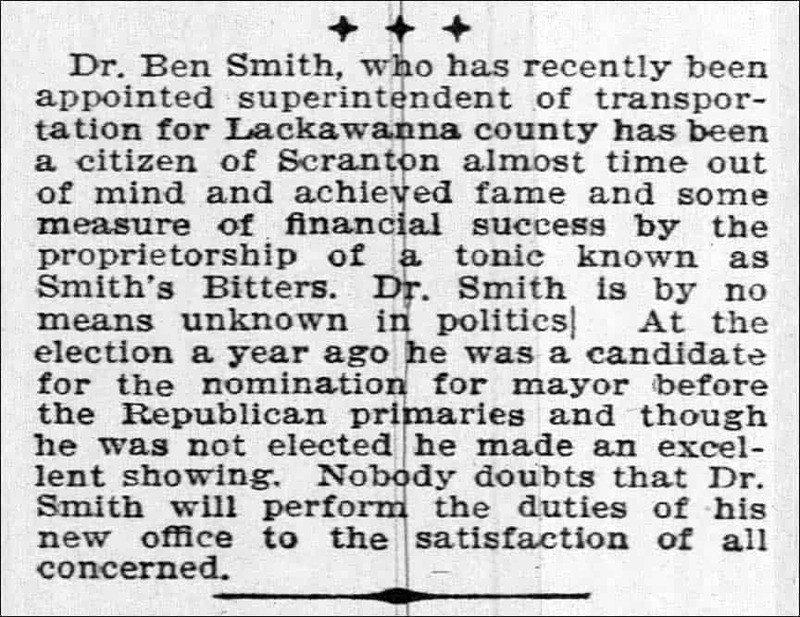 Here a Dr. Ben Smith in Scranton, Pennsylvania was noted as gaining fame for being the proprietor of a tonic known as Dr. Smiths Bitters. Again, not our Dr. D. Smith. This is obviously related to S 123: L…Dr. Smiths Colombo Tonic Bitters (Benjamin Smith, Scranton, Pennsylvania). 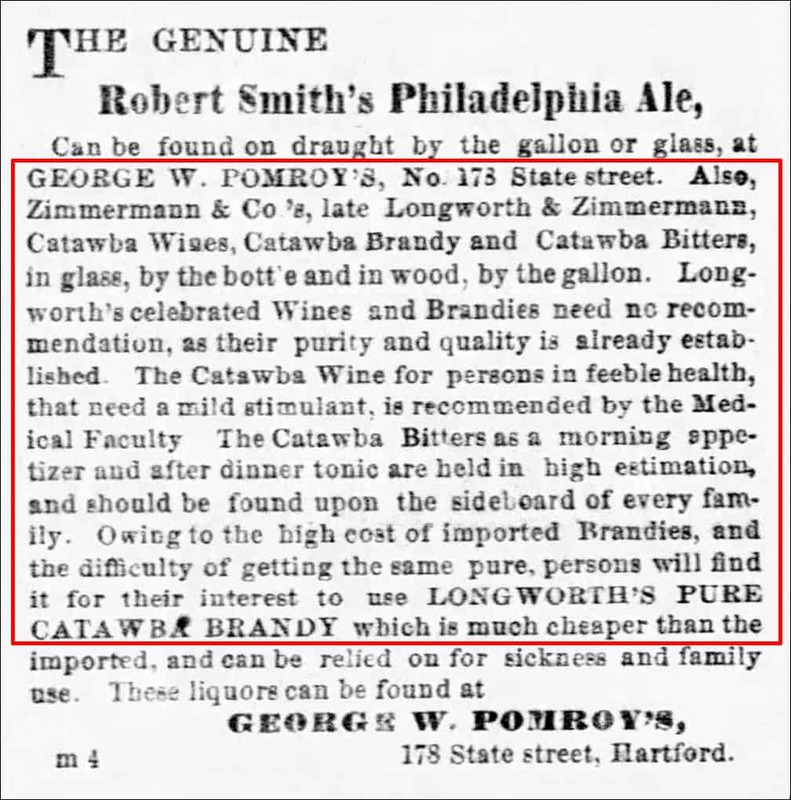 From the mid 1880s on, until the early 1920s, I found a number of references to Dr. Smiths Bitters in newspapers without a proprietor reference. 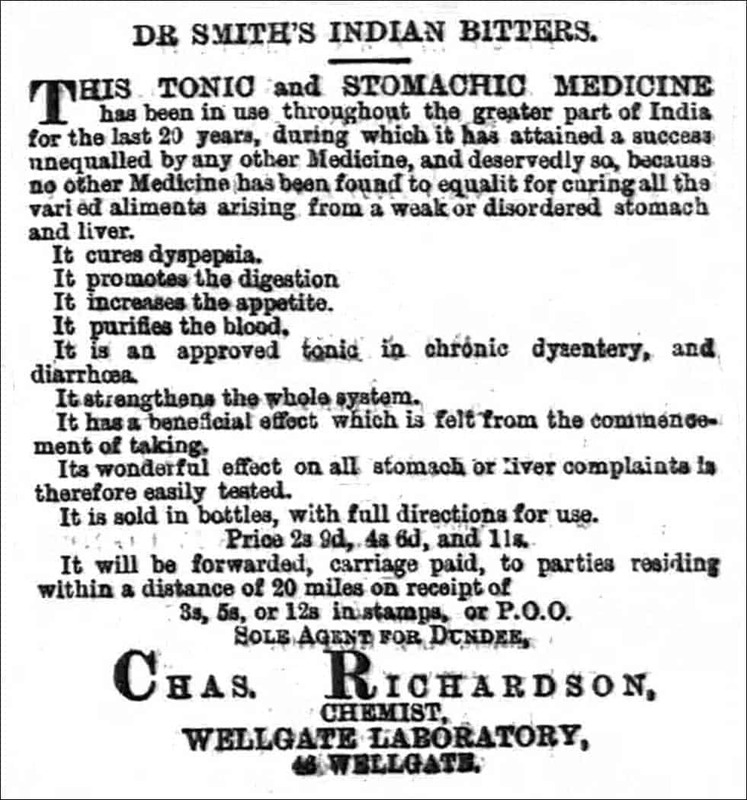 As it turns out, Dr Smith’s Bitters was being used as a generic name to reference any bitters. I guess it could have been Dr. Jones too. Three examples are referenced below. 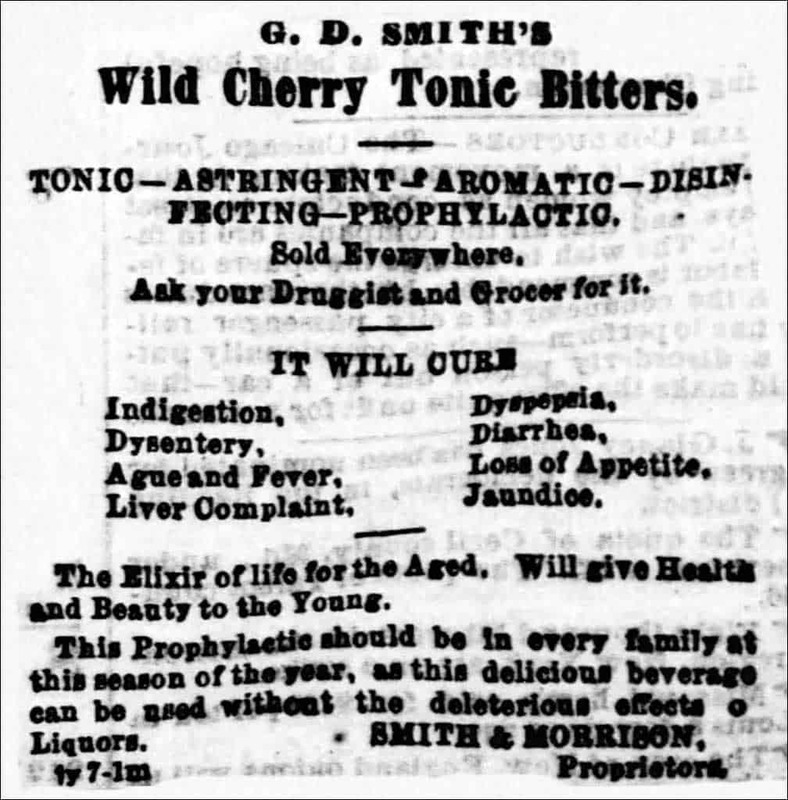 It’s interesting because when I search for information for this bottle I come up with a strong hit for ‘Smith’s Wild Cherry Tonic Bitters’ put out by Smith & Morrison in Washington, D.C. The proprietor’s were Gaston Delroy Smith and Charles G. Morrison. 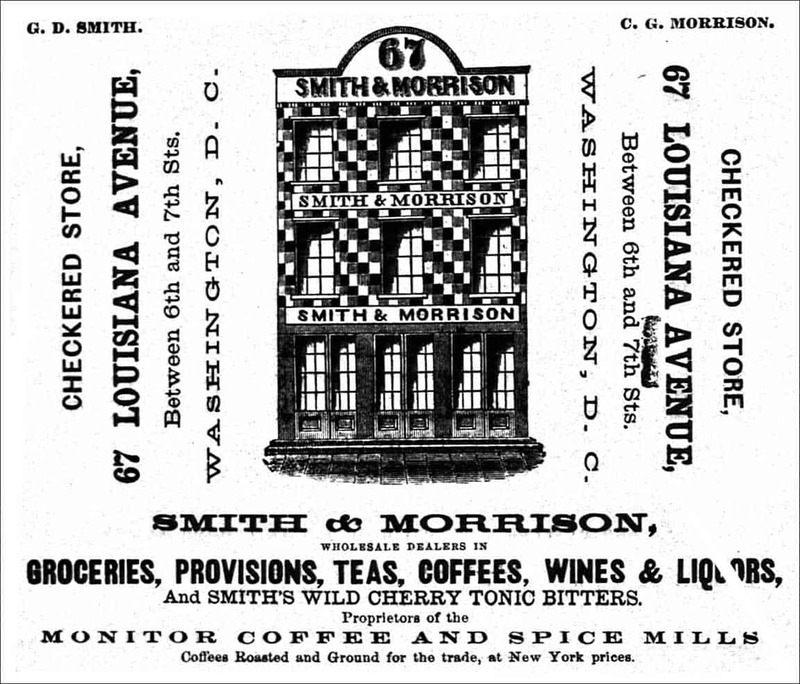 Both were grocers located at 67 Louisiana Avenue. Note that the bottle is embossed ‘Dr. D. Smith’s Wild Cherry Tonic Bitters.’ With no hits coming off a ‘Dr. D. Smith’, I wonder if Smith and Morrison added the ‘Dr’ and ‘D’ to represent ‘Delroy’. 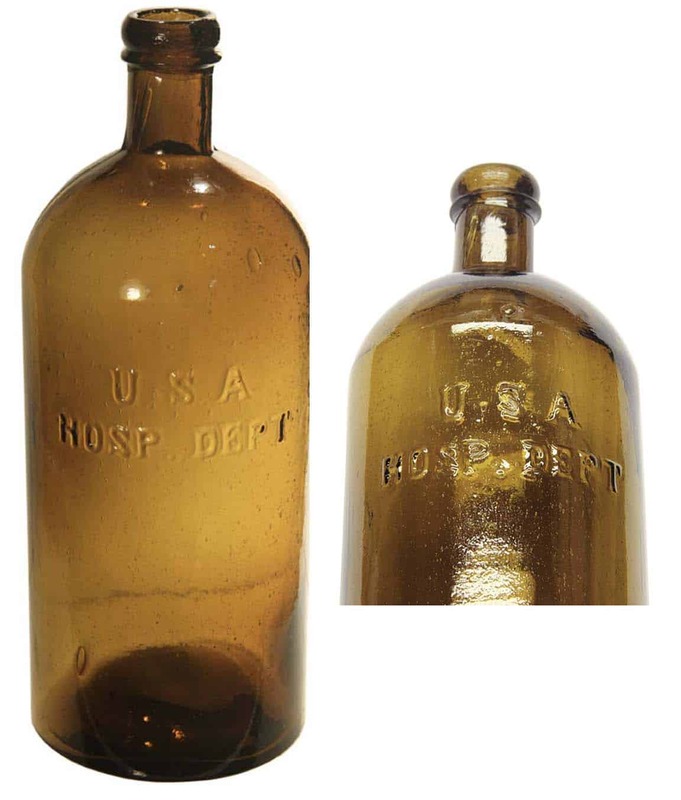 Many bitters have a ‘Dr.’ name to give the brand legitimacy as a medicine even though it was full of alcohol and the person was not a doctor. I also wonder if he went by Delroy Smith? 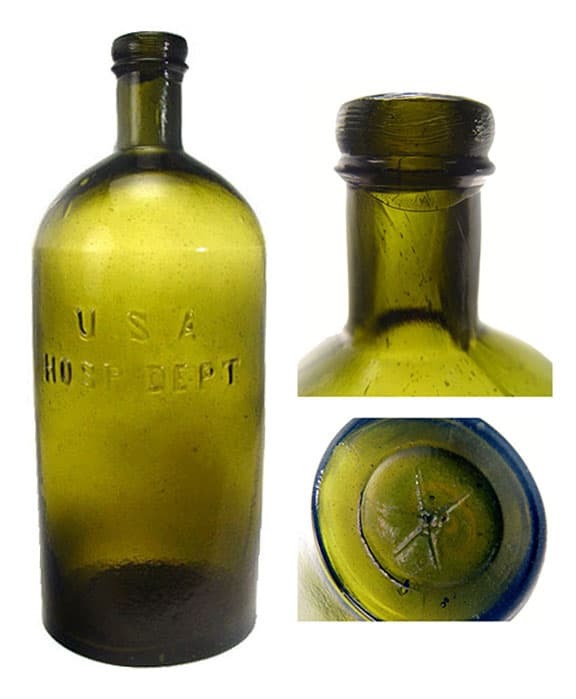 I like these little pocket or coffin flasks especially when they have interesting locales embossed on the bottles such as this W. J. 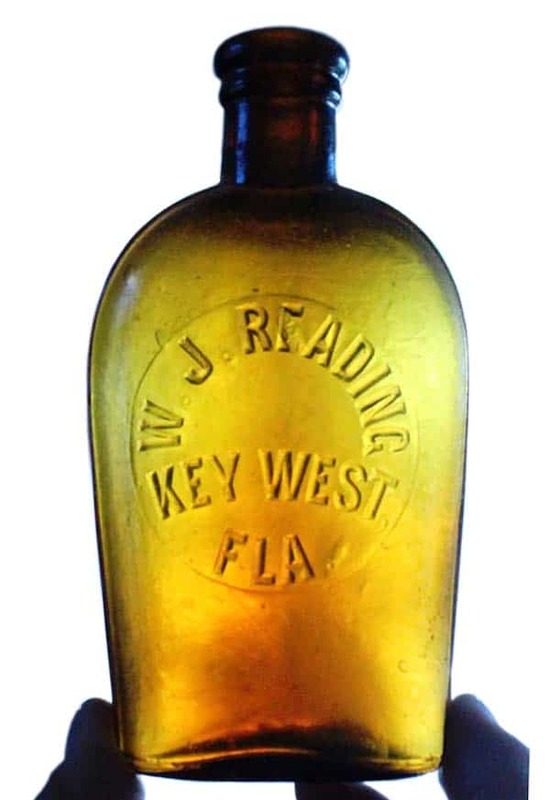 READING, KEY WEST, FLA. bottle. This image was found sitting all-alone and misfiled in my database. No idea where I initially found it or who sent it to me. So, is there a story here? A search online reveals that William J. Reading was living in 1880 in Key West, Florida and working as a wood chopper. He was born in Chelsea, Massachusetts in December 1851. As to why he went to Key West at the most southern part of Florida is a mystery. Surely, wood chopping was more lucrative in Massachusetts. By 1900, he is listed as a liquor and cigar dealer living at 905 Division Street. He is married to Pricilla Reading (37) who was born in Florida. 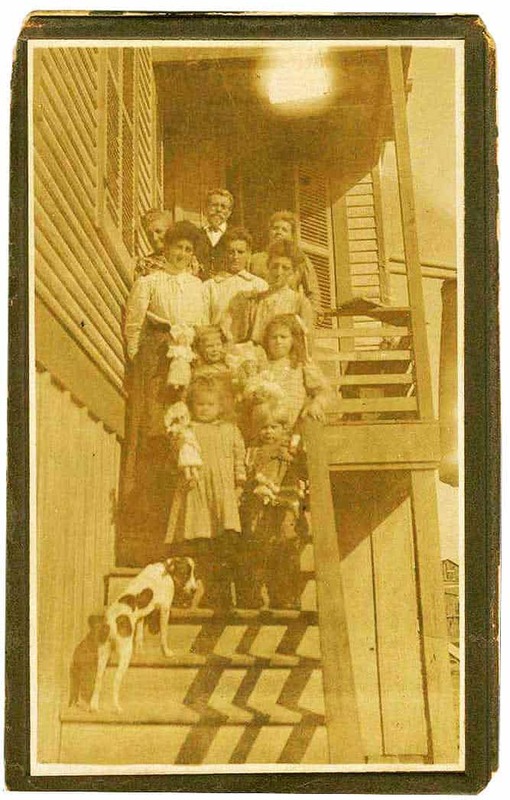 Their children are Leslie Reading (14), Maud Reading (12), William Reading (9), Flora B Reading (7), Gracie Reading (6). Young William Edward Reading would stay in Key West and later work for a cigar factory and ice company. I’m glad he did not choose to move back to Massachusetts to sell ice. There also is a listing for William J. Reading who worked in one of the Key West Cigar factories. I had thought that most cigar manufacturing came out of Ybor City in Tampa. Once, I had actually watched some older ladies rolling tobacco and making cigars for sale. They were even smoking cigars while they were making each cigar. 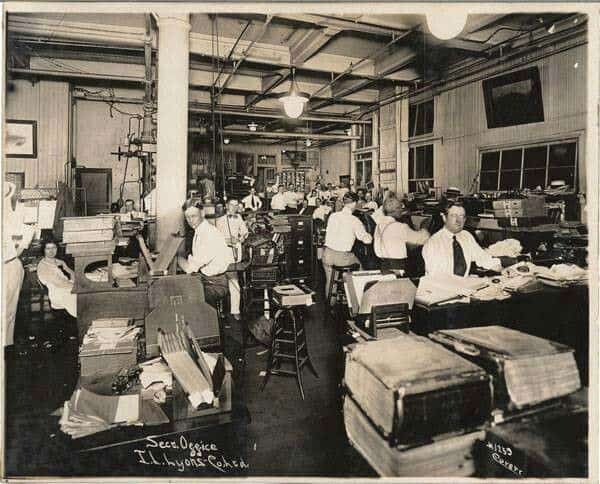 The picture above depicts female cigar packers on the second story of a cigar factory in Ybor City in 1892. Scott Tyson responded to a Facebook post where I had pictured the flask and said that he lives near Key West and has never seen an example before. He added that Key West was a huge cigar manufacturing town, not just Ybor City in Tampa. Key West had a large Cuban immigrant population with fairly easy access to the port of Havana, Cuba only 90 miles away. 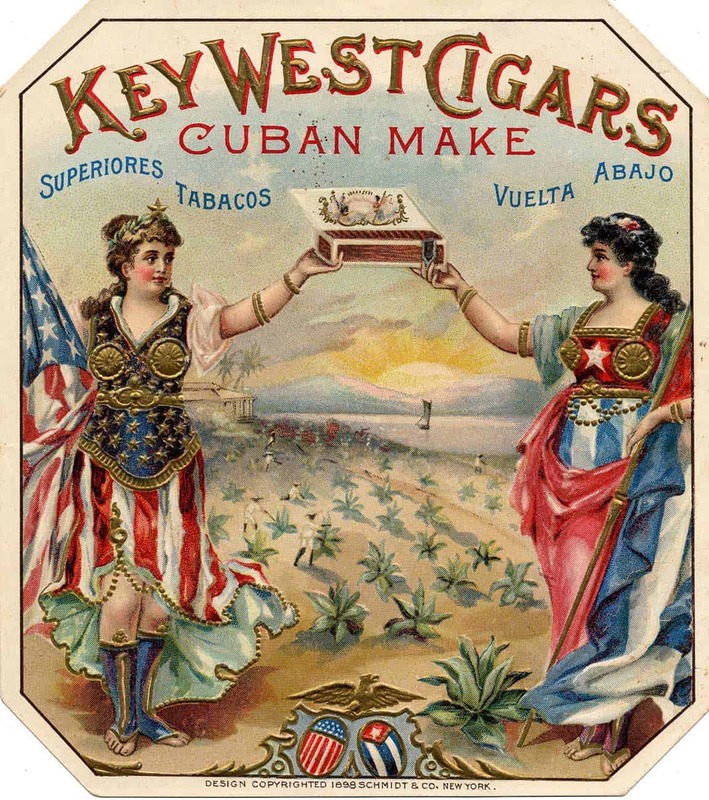 Cuban tobacco was even then known to be of excellent quality, and Key West cigars were sought after and sold all over the United States in the late 19th Century. Many of the cigar rollers were Cubans. Key West still has many of the old cigar factory buildings and the cigar makers cottages, and a few mansions built by the factory owners. 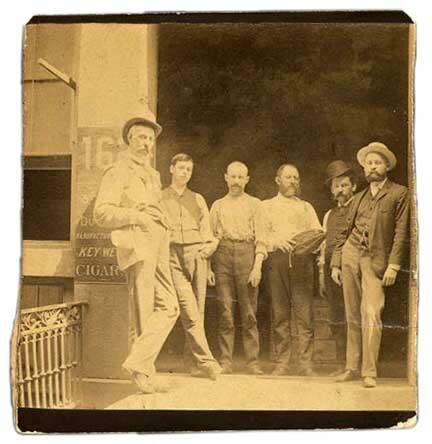 I found the photo above with six men standing in front of the Key West Cigar Factory. The only identified man in the picture is William E. Dubois (1849-1933), standing on the far right. He was born and raised in Ulster County, but left to pursue a career in cigar manufacturing. 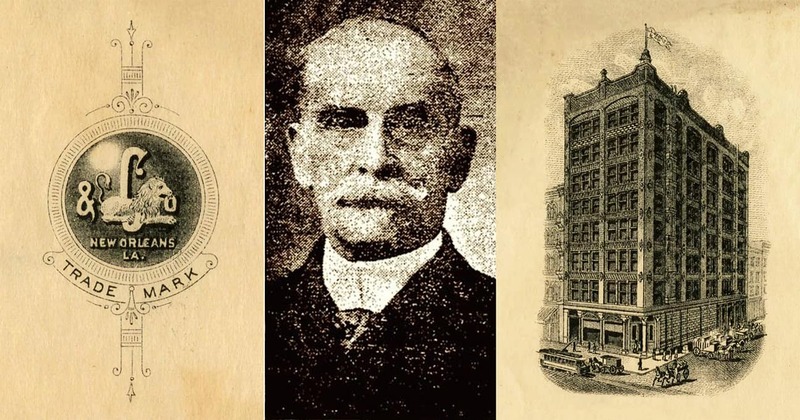 William proved to be extremely successful at this business venture and was soon involved with four different cigar factories, one in Manhattan and three in Key West. Marianne Dow also replied on Facebook that she found a W. J. 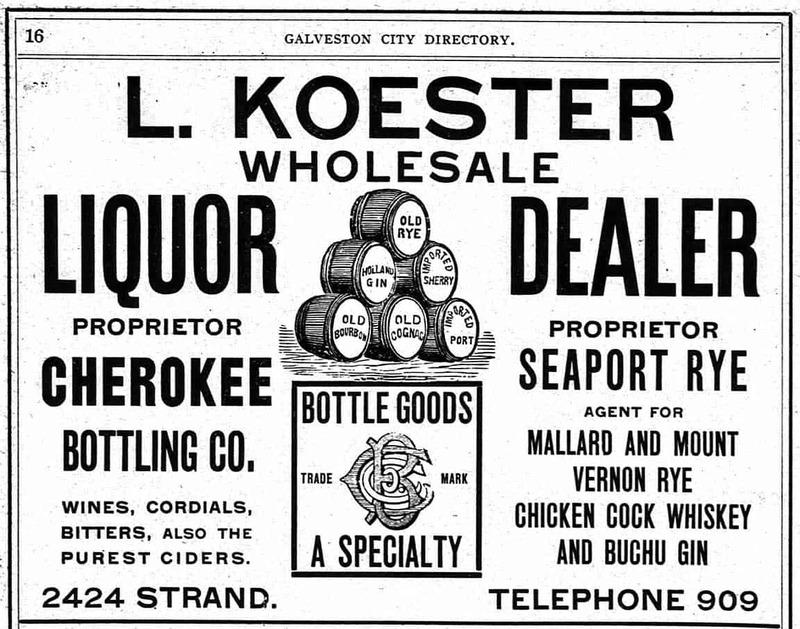 Reading listed as a liquor distributor in 1900 and 1903. She then found a 1930 newspaper report that the Key West landmark ‘William Reading home’ burned down. So not much is known about this bottle or W. J. Reading. As Scott Tyson commented, cigars and whiskey, make sense. Maybe cigar retailers sold whiskey too. I would agree here. 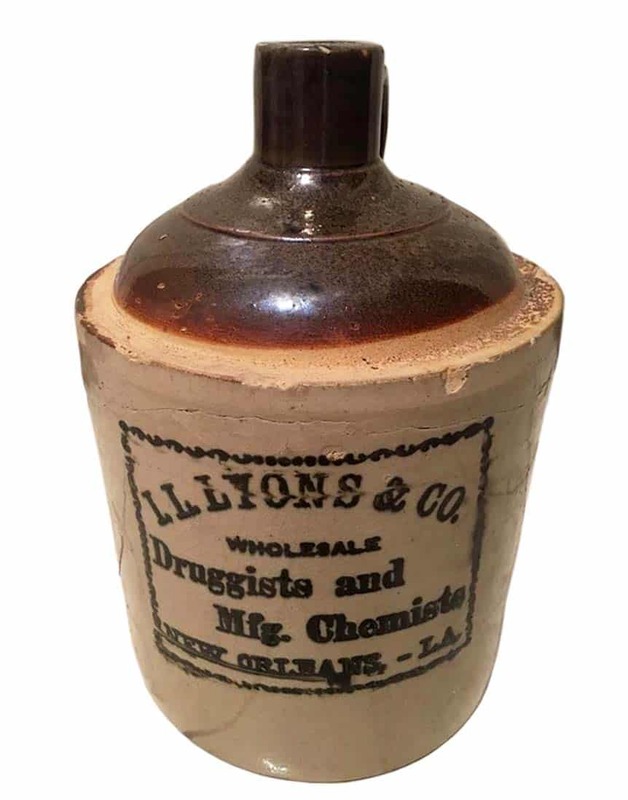 I like that, …”Dealers in Drugs & School Books” and also “Proprietors of Reed’s Celebrated Overland Bitters.” Here is another super tough, extremely rare bitters. 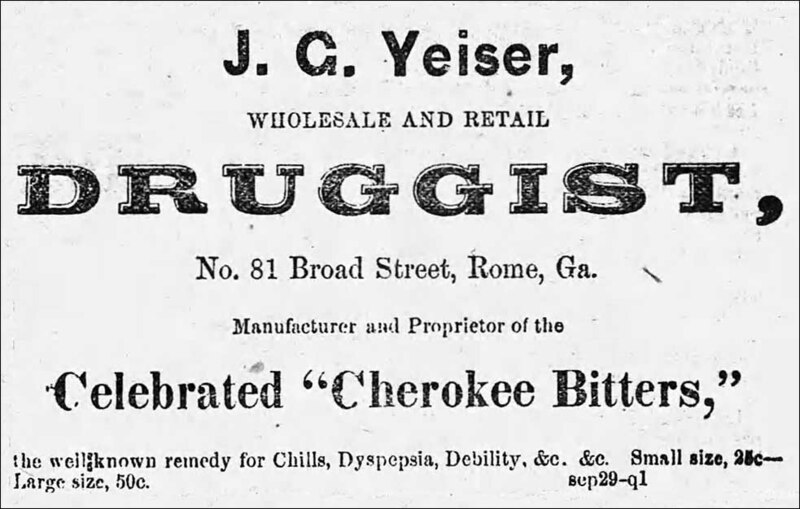 I posted the 1870 advertisement below in Daily Dose last August. 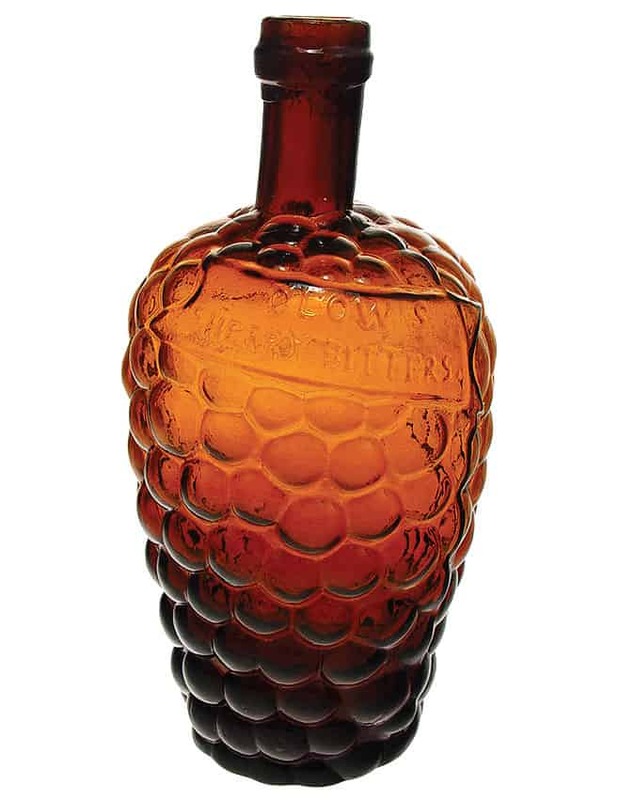 Now, as it turns out, a bottle example (pictured above) is in the current American Glass Gallery Auction #22. 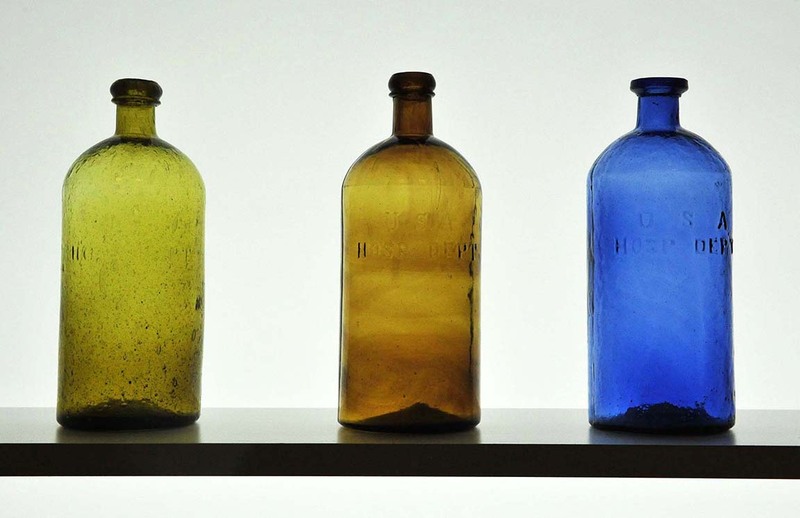 Thanks to Jeff Burkhardt for calling my attention to this bottle and inspiring this post. If you notice on the advertisement, the Reed Brothers consisted of John Reed, James Reed and Michael Reed. Their establishment was located on 9th Street, West Side Market Space in Lincoln, Nebraska. 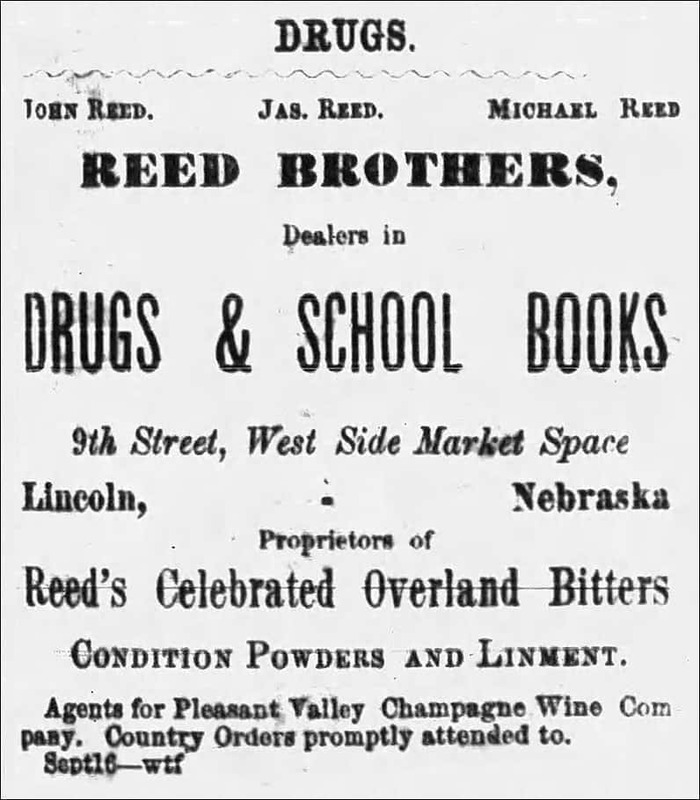 Again, they were the Proprietors of Reed’s Celebrated Overland Bitters which is prominently noted on the bottom half of the ad which was found in The Nebraska State Journal on Friday, November 4, 1870. 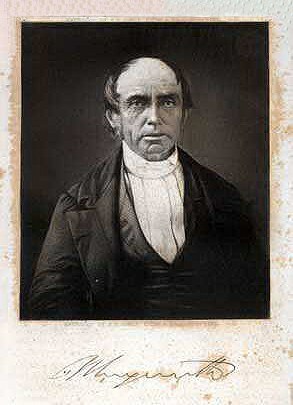 John Reed was the lead and oldest brother of the Reed Brothers. He was born around 1841 in Birmingham, England. His younger brothers, James and Michael were twins born on July 26, 1845, also in Birmingham. All three came to Nebraska City, Nebraska Territory with their mother in 1858. For whatever reason they settled in Nebraska Territory from England, I am unsure. I bet that was quite a change. 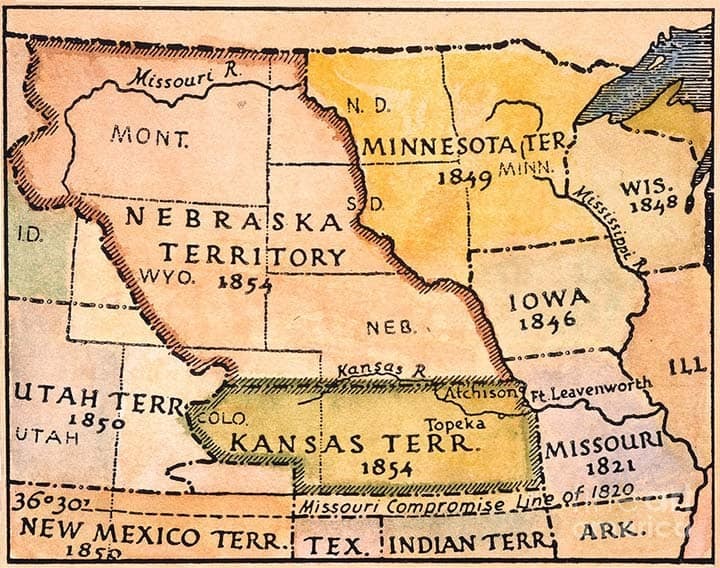 The first map below shows Nebraska Territory in 1854. The second map shows Nebraska City and what would soon be Lincoln, Nebraska. Omaha is also marked for reference. The third map is an illustrated map of the Pony Express Route in 1860 by William Henry Jackson, courtesy of the Library of Congress. If you enlarge, you can see Nebraska City as a branch line leading to Fort Kearny. The primary route stated in St. Joseph, Missouri and terminated in San Francisco. Nebraska would become our 37th state on March 1, 1867 when the first wave of settlement gave the territory a sufficient population to apply for statehood. The capital was moved from Omaha to the center at Lancaster, later renamed Lincoln after the recently assassinated President of the United States, Abraham Lincoln. We next come across John Reed when he is noted as a 19 year old mail carrier in Nebraska City, Nebraska Territory in an 1860 United States Federal Census. He probably worked for the Overand Express or a subsidiary. 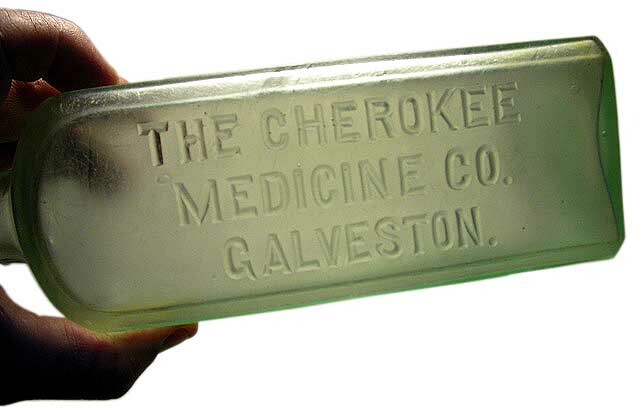 The “Overland” reference would eventually be the name of a line of medicines the Reed Brothers would put out, and of course, a reference to their Overland Bitters. 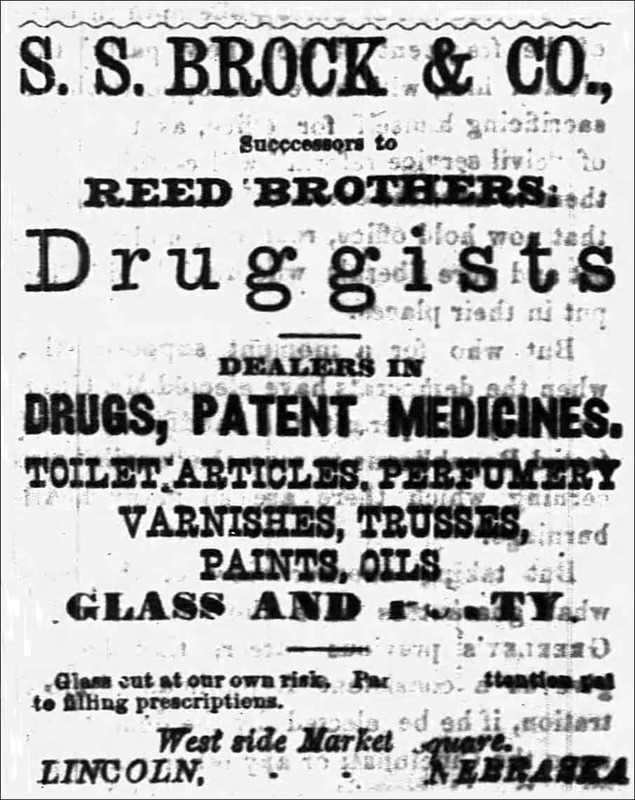 It looks like the Reed brothers first went into the drug business clerking for the drug store of Daniel Whitinger in Nebraska City sometime in the early to mid 1860s. Whitinger was a physician and druggist who was born around 1830 in Indiana. Soon, John would become a partner and the drug store was renamed Reed, Whitinger and Co. 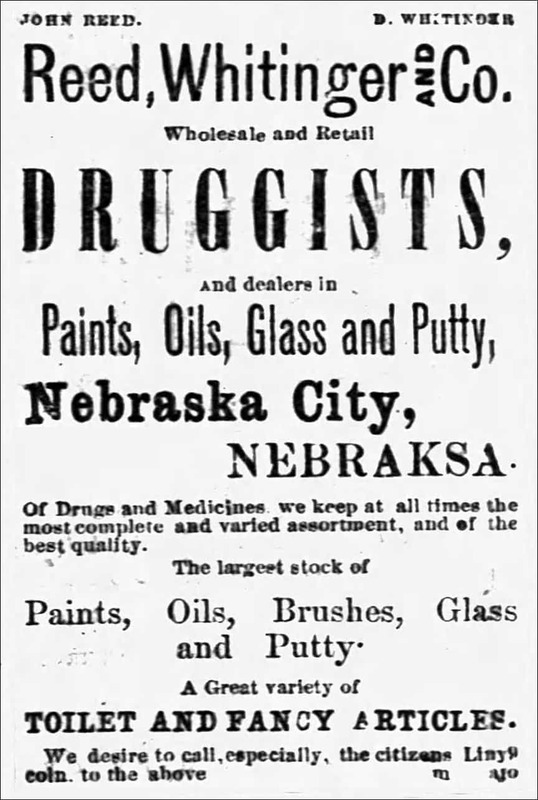 They were listed as Wholesale and Retail Druggists in Nebraska City, Nebraska in 1868. John would have been about 27 years old. The twins, James and Michael, would continue to work as clerks. 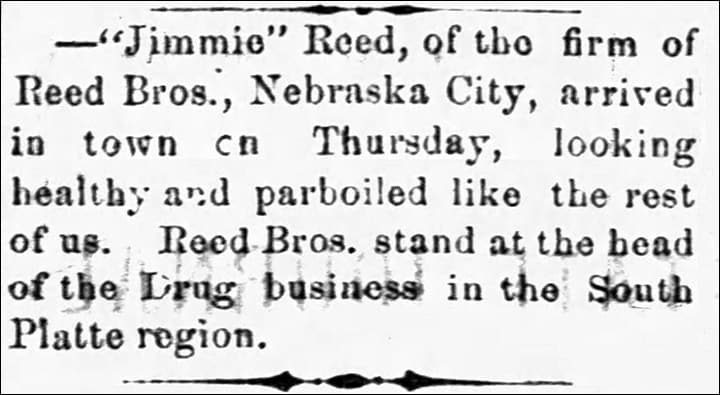 Eventually the firm of James Reed & Bros. was formed and continued for many years in Nebraska City. Whitinger would continue as a physician. 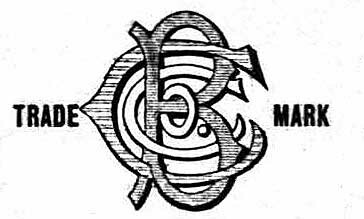 In the spring of 1867, the firm of Reed Brothers was organized and they were located in the newly named Lincoln, Nebraska. 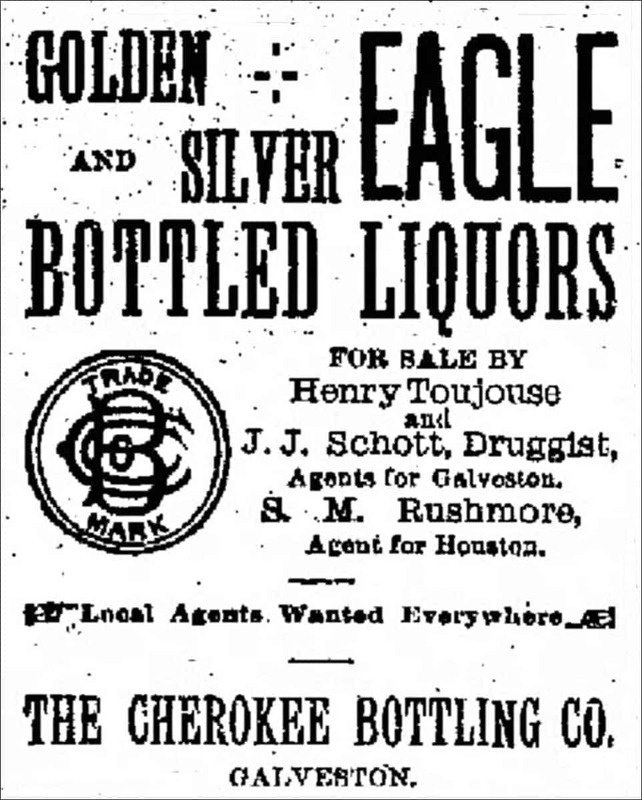 This was the only year that they were listed as the Proprietors of Reed’s Celebrated Overland Bitters. 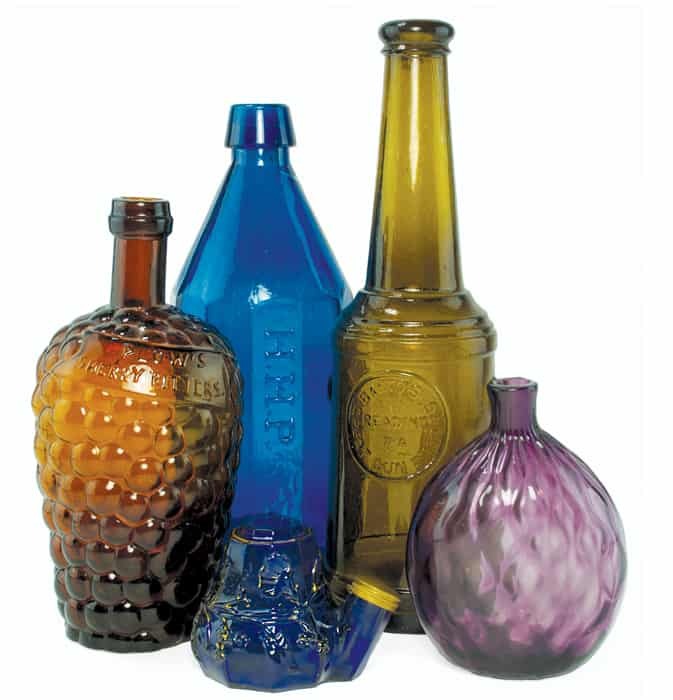 Lorenz & Wightman of Penn Glass Works in Pittsburgh, Pennsylvania made the bottles as you can see from the base embossing below. 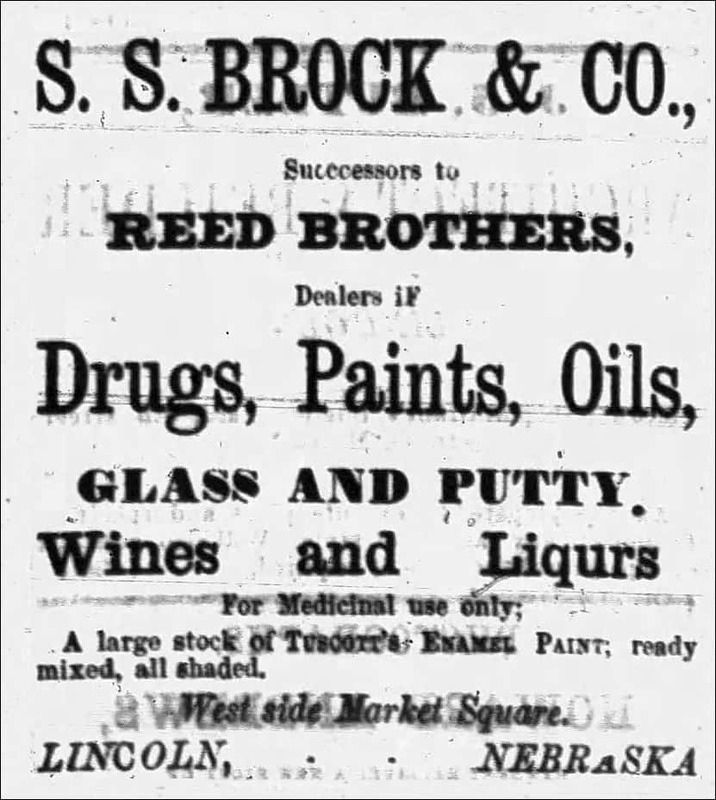 The Reed Brothers would continued until 1871 when S. S. Brock & Company were announced as the successors to Reed Brothers at the same address on West Side Market Square in Lincoln. James Reed, as noted above would carry the touch in Nebraska City. 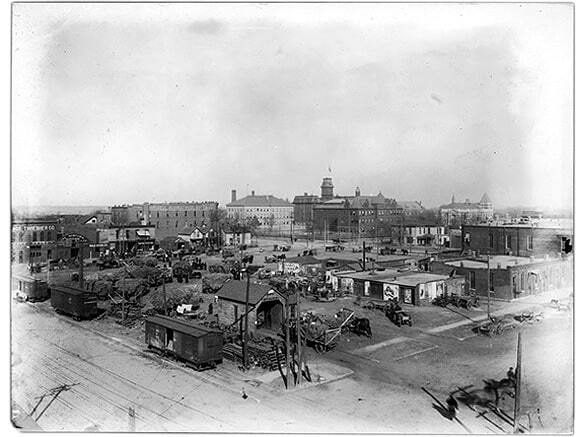 Market Square eventually became Haymarket Square which is represented below. 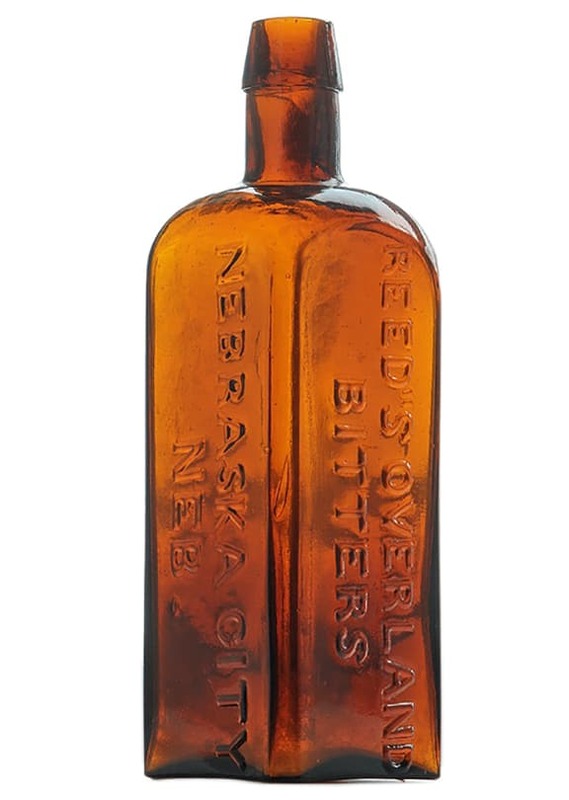 “REED’S OVERLAND / BITTERS – NEBRASKA CITY / NEB”, Lorenz & Wightman, Penn Glass Works, Pittsburgh, PA, 1867 – 1872. 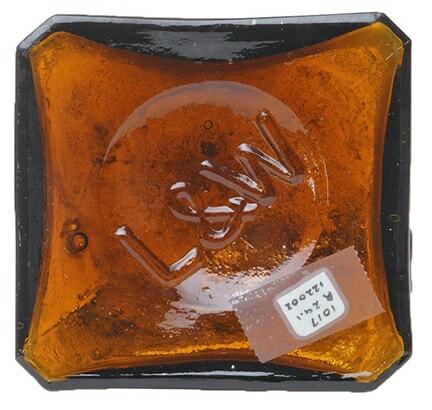 Medium amber, square with beveled corners, applied sloping collar – “L&W” on smooth base, ht. 8 ¾”; (a bit of minor content haze in the base; a little exterior dullness, primarily on a side label panel, otherwise very near mint). R/H #R29. Extremely rare! 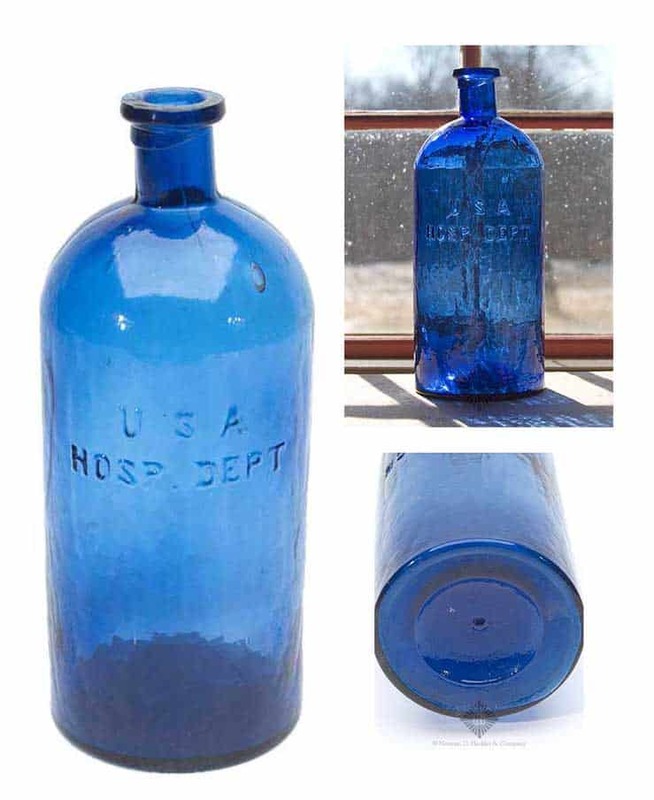 Possibly the 1st example of this great Nebraska bitters to be offered at public auction. 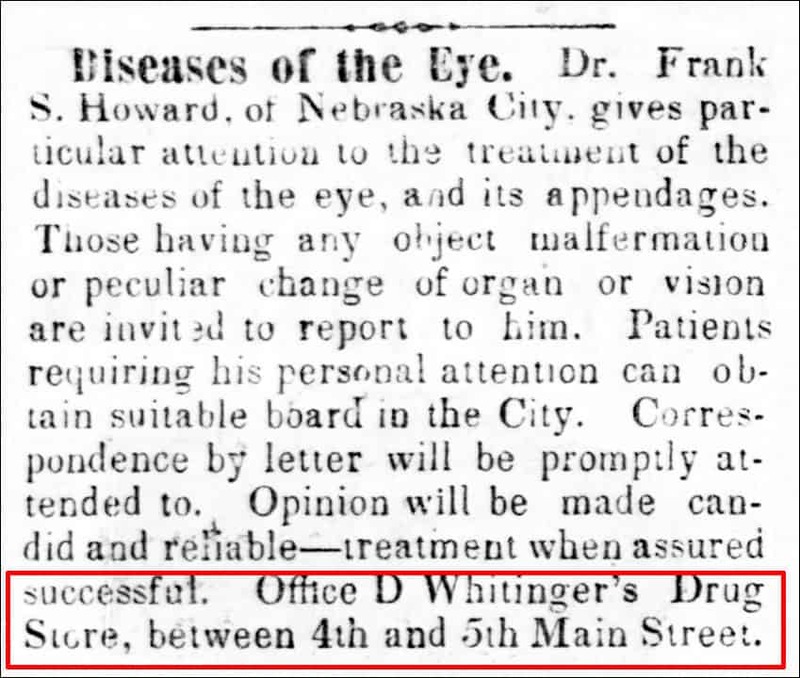 This exceedingly rare square from Reed’s Drug Store, Nebraska City, Nebraska, was obviously playing off the name of the famous Overland Trail. The Trail was also known as the Overland Stage Line, an 1860’s Western stagecoach and wagon trail that passed through parts of Nebraska. 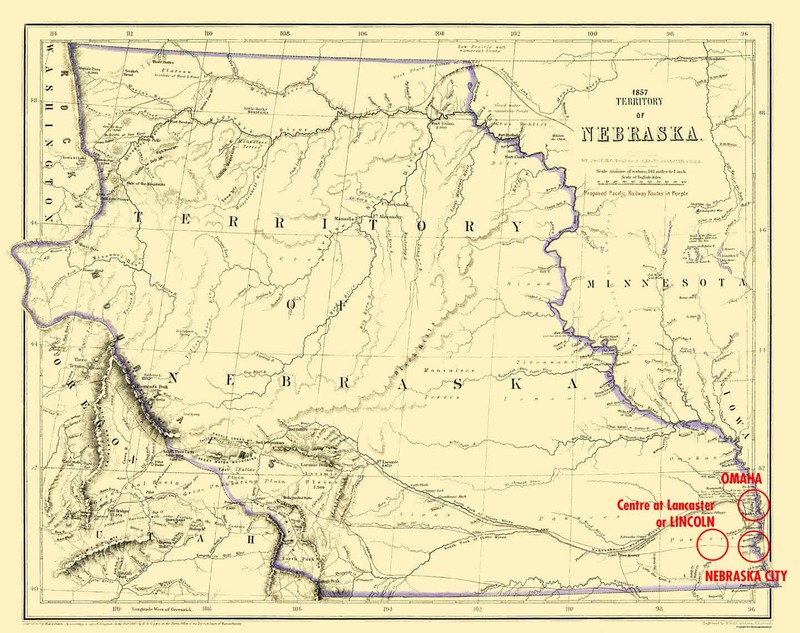 1867: Nebraska Statehood. 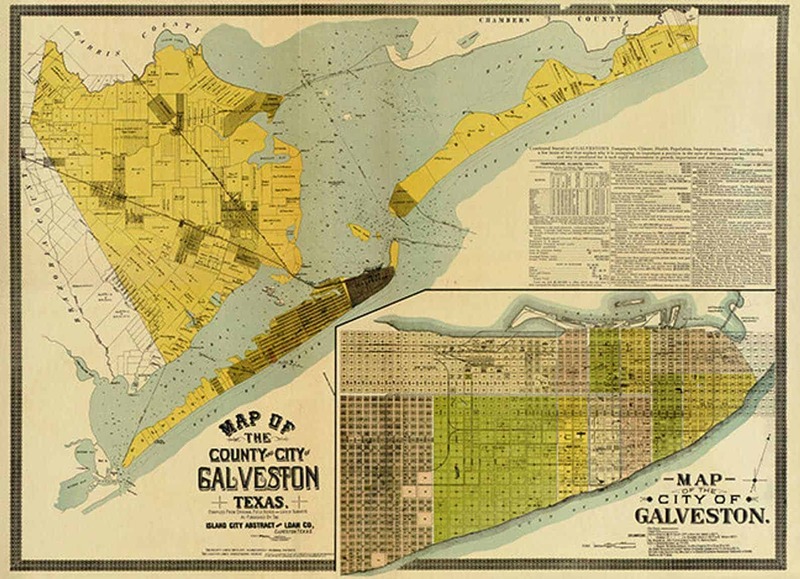 The first wave of settlement gave the territory a sufficient population to apply for statehood. Nebraska became the 37th state on March 1, 1867, and the capital was moved from Omaha to the center at Lancaster, later renamed Lincoln after the recently assassinated President of the United States, Abraham Lincoln. 1871: James Reed was married in Circleville, Ohio, March 30, 1871, to Josephine P. Rector, a native of Pickaway County, Ohio. They had two children. Norris Humphey and Dwight James. Mr. Reed is a member of the A., F. & A. M., K. of H., and Royal Arcanum. 1881: Michael Reed was married at Belvidere, Neb., October 4, 1881, to Miss Sallie Hole, a native of Havana, Ill.
Nicholas Longworth was an influential figure in the early history of American wine, producing sparkling Catawba wine from grapes grown in his Ohio River Valley vineyard on hills north of Cincinnati. 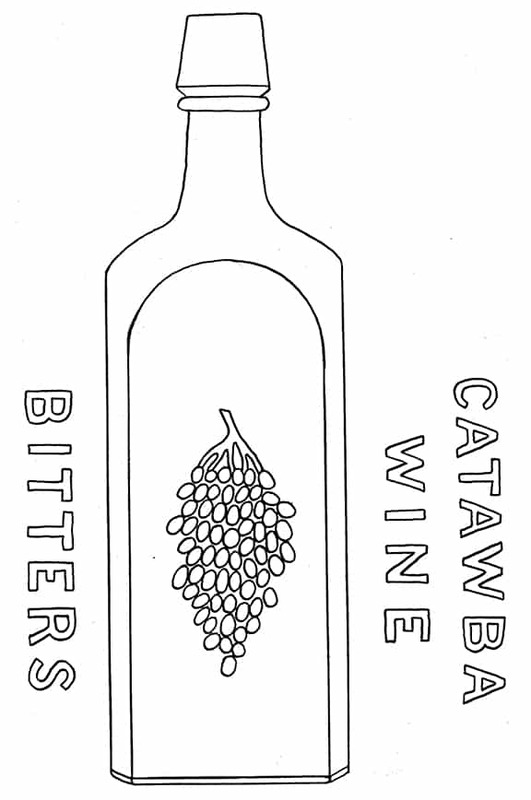 He was also responsible for Catawba Wine Bitters, and the bottles embossed with the cluster of grapes. 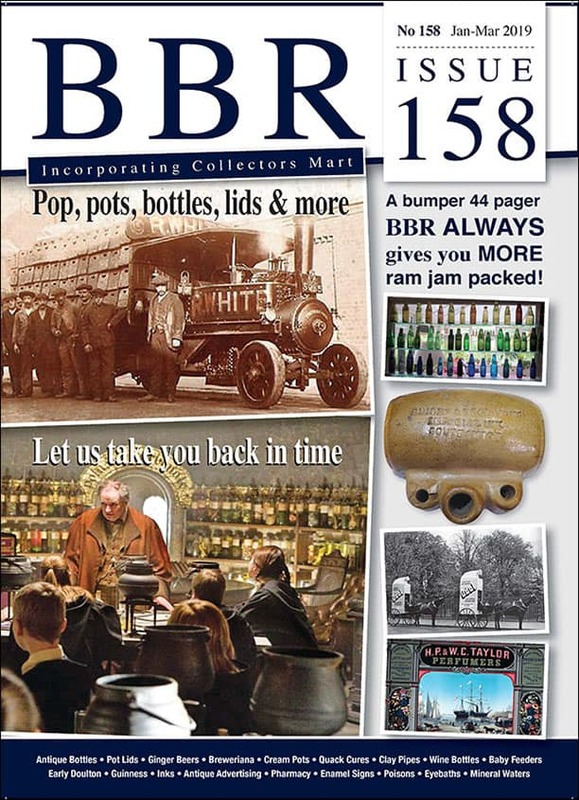 Highly desirable to collectors. The Carlyn Ring and W.C. Ham listing in Bitters Bottles is as follows. The listing may want to be updated. Nicholas Longworth was the founder of the prominent Longworth family in Ohio and considered the first millionaire in Cincinnati. 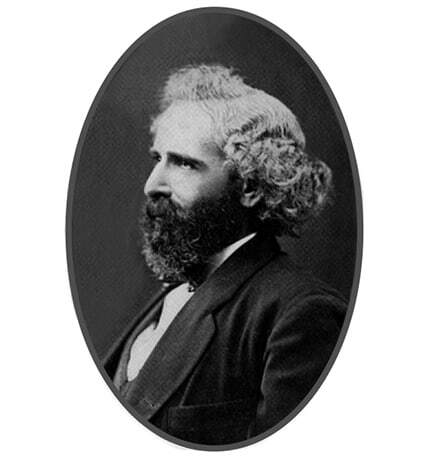 He was also known as the “Father of the American Grape Culture.” Among his many other attributes, Longworth was an attorney, banker, merchant, horticulturalist, abolitionist, author, and an art collector. Nicholas Longworth was born on January 16, 1783 in Newark, New Jersey. His mother was Apphia Davis Vanderpoel. His father, Thomas Longworth was a Tory or Loyalist who were American colonists who stayed loyal to the British Crown during the American Revolutionary War. Their very existence was complicated as every British Functionary who refused to betray the trust placed in him was consider a traitor by the Patriots. After a spell, Longworth would leave South Carolina, arriving in Cincinnati, Ohio in 1803. Cincinnati at this point was just a burgeoning town and soon to be a city. 1803 was also the same year Ohio was granted statehood. There, he married Susanna Conner, née Howell, three years his junior who was the daughter of Silas and Hannah (Vaughan) Howell, on Christmas Eve, 1807. Longworth was a little man, and eccentric in dress, speech, and manner. He was also strong-willed and successful, so that he could afford to do as he wished. Longworth, even with all his interests, was never a political candidate nor held any political office. He was also not a faithful member of any religious organization. Grape-growing would soon dominate his life. 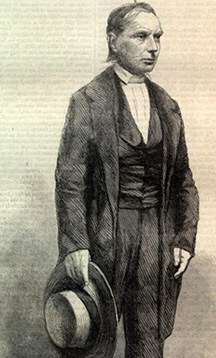 Longworth first studied law under Judge Jacob Burnet, a well-known lawyer of great standing. Burnet was a member of the Territorial councils of Ohio from 1799–1802 and served in the Ohio State House from 1814–1816. He was considered the ‘father of the Ohio constitution’ and was an associate justice of the Ohio Supreme Court from 1821 until his resignation in 1828 to serve as United States Senator. Even without a formal education, Longworth studied hard and applied himself and was admitted to the bar in Ohio. He practiced as an attorney until 1819 in Cincinnati while buying large tracts of land. He next ventured into real estate, flipping property as his real estate dealings proved more lucrative than law. The property that he bought for a song all those years was now worth millions, and Longworth joined John Jacob Astor as one of the two largest taxpayers in the United States. Believing Cincinnati to be an ideal location for grape cultivation, Longworth established viticulture as a successful venture on the hills adjoining the city. Along the main highway from east to west during the period of early settlement, Ohio had inevitably seen repeated trials of viticulture, suggested by the combination of southward-facing slopes and broad waters. Longworth would finally make it work. Planting hundreds of acres and building a large wine-house, Longworth started his vineyards in 1813 and by 1820 became more serious about producing wine that would be a commercial success. At first, he was using foreign vines exclusively and was somewhat unsuccessful until 1828, when he introduced native vines or their seedlings and produced, from the Catawba, and Isabella grape, a wine of a high marketable value. He was also well-known for his experiments with strawberries and published “Buchanan’s Treatise on the Grape, with an Appendix on Strawberry Culture” in 1856. Besides being a pioneer and leading horticultural expert in his section, Longworth was recognized as an authority in national horticultural matters. His writings, though individually short and now out of date, exercised a wide influence in his day. He might be compared to Isidor Bush who put out Missouri IXL Bitters. Longworth planted a vineyard of Catawba on the Mount Adams hillside and began making a sparkling wine from the grapes using the traditional method used in Champagne. 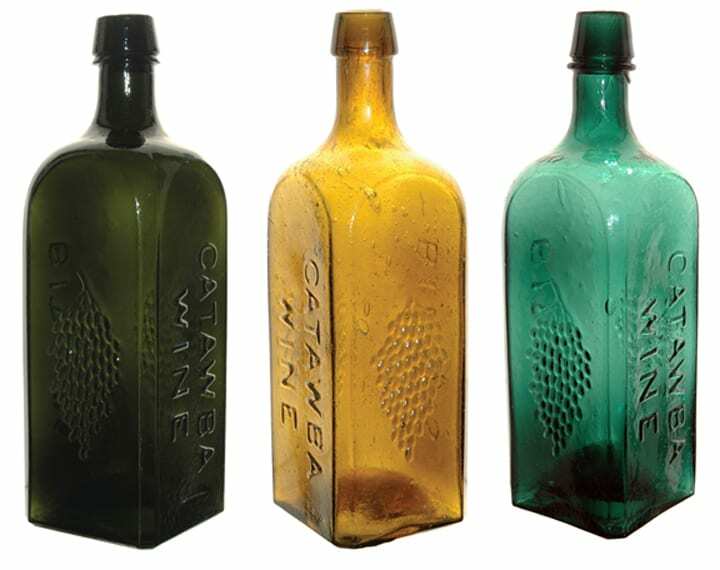 From the 1830s through the 1850s, Longworth’s sparkling Catawba was being distributed from California to Europe where it received numerous press accolades. He was then producing 100,000 bottles of sparkling Catawba a year and advertising nationally. 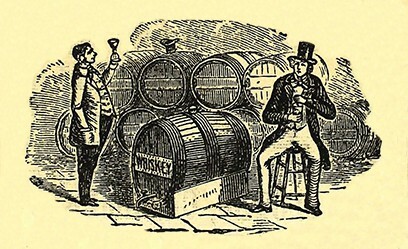 In the 1850s, a journalist from The Illustrated London News noted that the still white Catawba compared favorably to the hock wines of the Rhine and the sparkling Catawba “transcends the Champagnes of France.” The illustration above represents the Longworth vineyard from the Harper’s Weekly, 24 July 1858. More dulcet, delicious and dreamy. 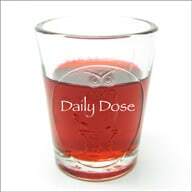 Or at best but a Devil’s elixir. The growing tide of German immigrants coming down the Ohio Valley to Cincinnati liked his wine. Longworth had found a lucrative market and the new German immigrants wanted an affordable, drinkable table wine to continue with the traditions of their homeland, so he enjoyed a virtual monopoly. By this time, Longworth would become one of the wealthiest people in the United States. 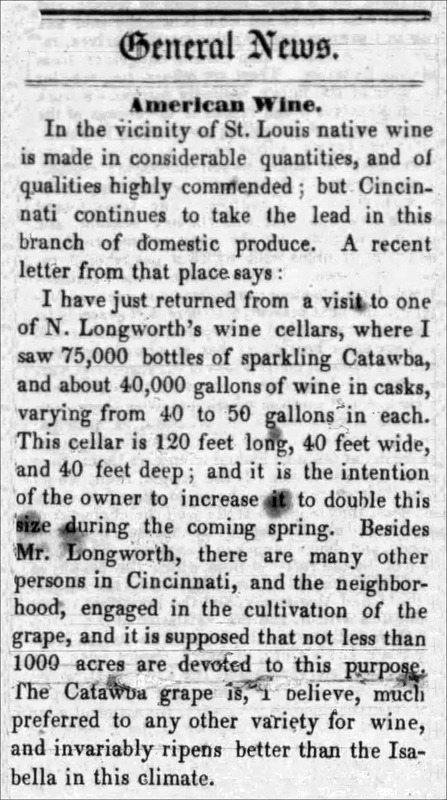 A visit to one of Nicholas Longworth’s wine cellars in 1851 revealed 75,000 bottles of sparkling Catawba, and 40,000 or so gallons of wine in casks varying from 40 to 50 gallons each. 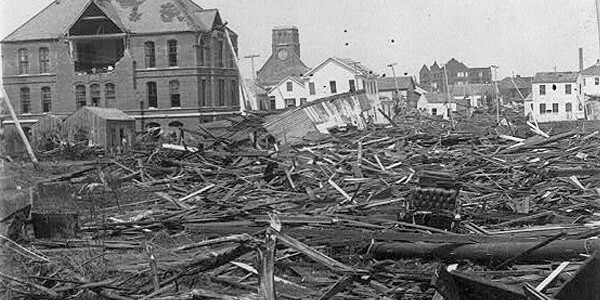 The cellar was 120 feet long, 40 feet wide and 40 feet deep. Longworth was preparing to double in size his capacity the following spring. 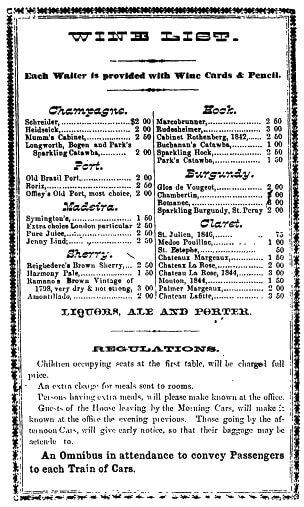 In 1853, Nicholas Longworth partnered with Caspar Zimmermann (Longworth & Zimmermann) to sell the Longworth wines wholesale. They were located at 177 Sycamore in Cincinnati. Anthony, John and Phillip Zimmermann were also part of the business according to a listing in a Cincinnati directory that year. By 1858, the enterprise was called Zimmerman & Co. and was being run by John, Phillip and Anthony Zimmermann. Their ‘chemical laboratory’ was located on the north side of 6th between Freeman and Canal. You see, Longworth wanted to jump on the profitable bitters bandwagon so he needed a partner and laboratory reference so he could call his product a medicine. 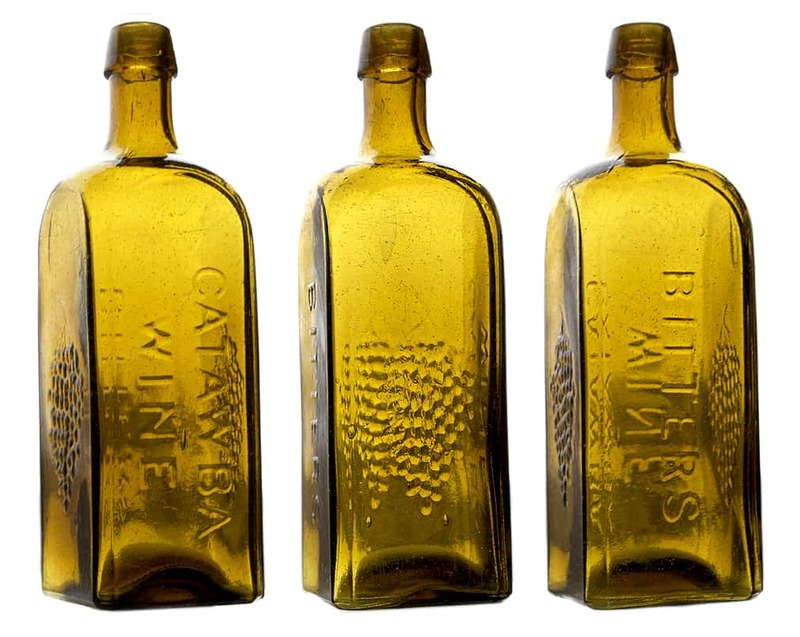 In 1859, the first advertisement for Cordial Catawba Bitters was found in a Buffalo, New York newspaper. 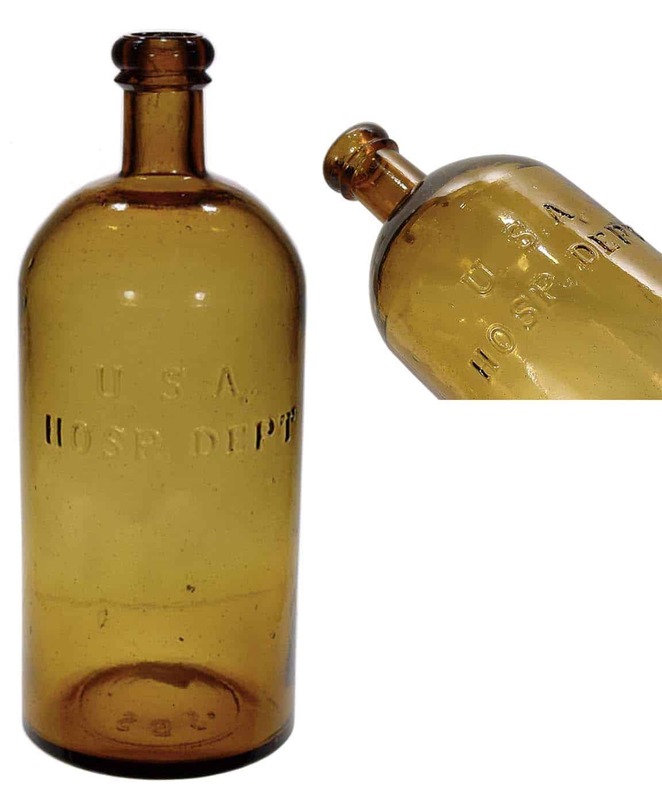 The bitters was noted for Pharmaceutical and Medicinal Purpose and was being manufactured pure, by Zimmermann & Co., Manufacturing Chemists of Cincinnati, Ohio. They were noted as the successors to Longworth & Zimmermann. By this time, Longworth was fading due to health issues. 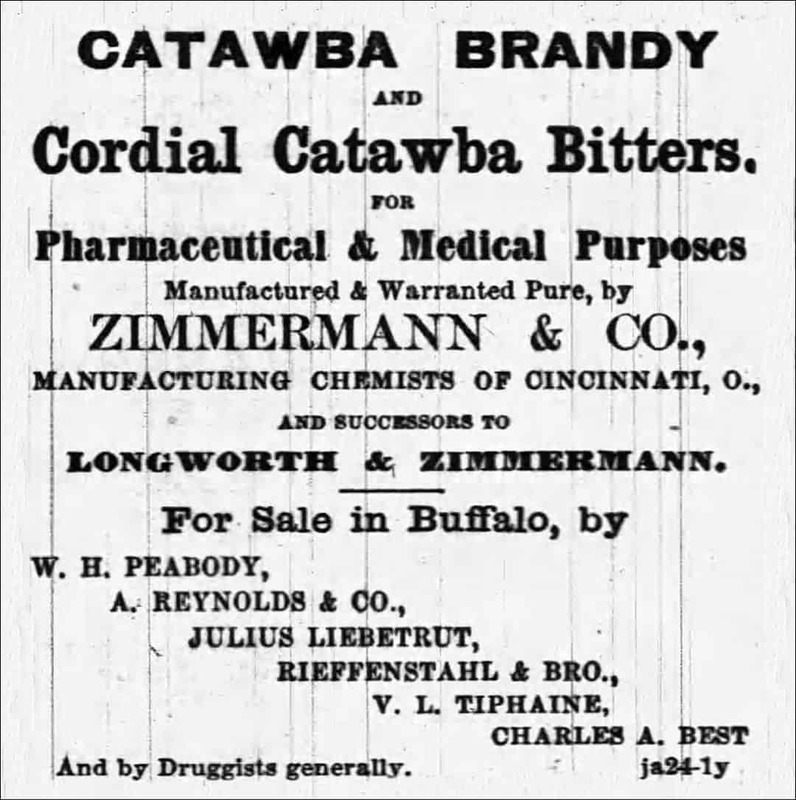 Longworth’s Catawba Bitters was said to be made from pure Catawba Brandy and warranted to cure the worst cases of Dysentery and Diarrhoea. The ads many times were directed to Civil War soldiers as a remedy for change of climate and fatigue. 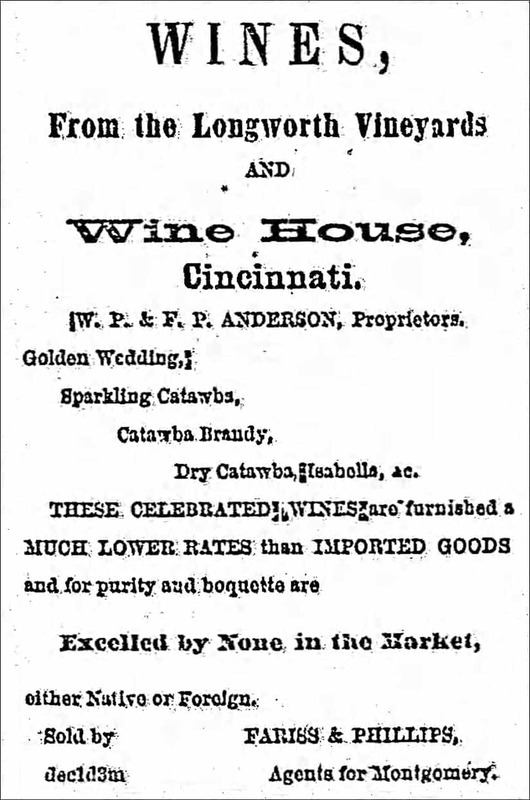 There is another Catawba Wine Bitters advertisement for Longworth & Grew, Cincinnati, Ohio noting that George T. Grimes as the Sole Agent in San Francisco. This is puzzling with all the Zimmermann references as there is no reference to a “Grew” in Cincinnati directories who might fit the bill. There is however a J. & B.L. “Crew” noted as grocers on the southwest corner of 3rd and Elm (J. Crew and B. L. Crew) in Cincinnati, Ohio in 1860. This is more likely the reference in the advertisement above. 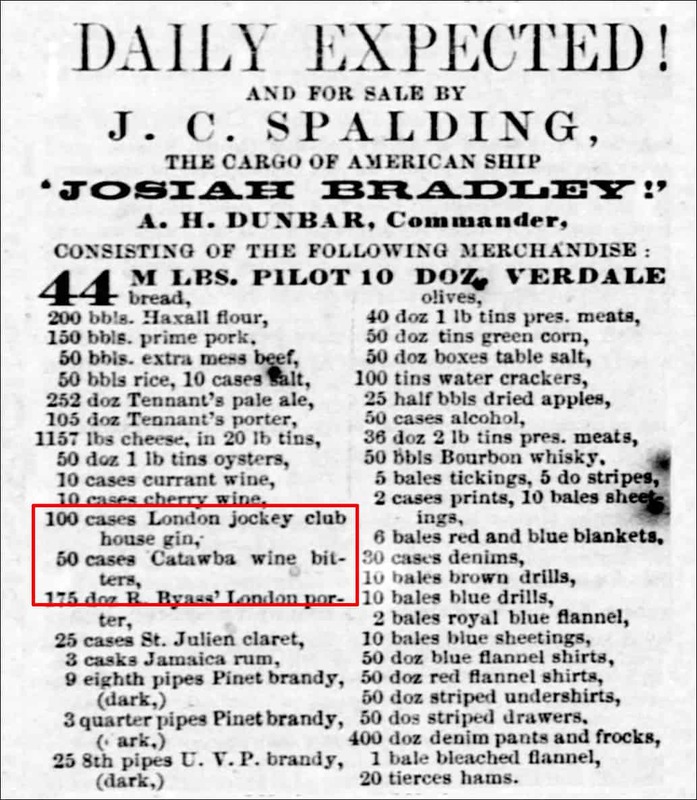 Another advertisement in 1859 states that J. C. Spalding was selling, from the cargo of the American ship Josiah Bradley, 100 cases of London Jockey Club House Gin and 50 cases Catawba Wine Bitters in Hawaii. So, if you are a digger, and are looking for pontiled examples, might I suggest you head to Buffalo or Honolulu. 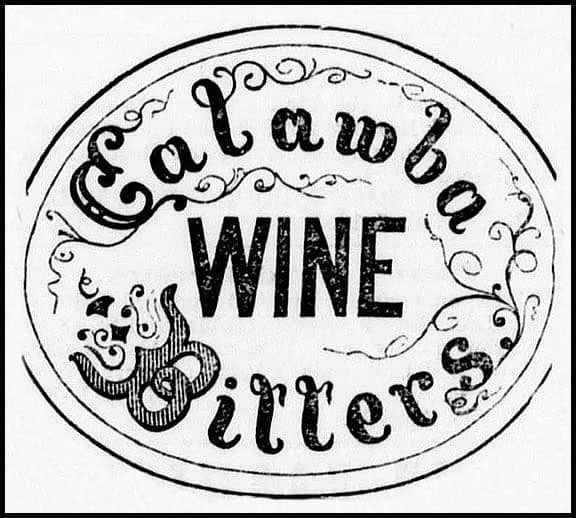 We see the last advertisements for Catawba Wine Bitters in 1865 in the Black Hawk Daily Mining Journal where cases of the bitters were being sold by J. P. Henry. 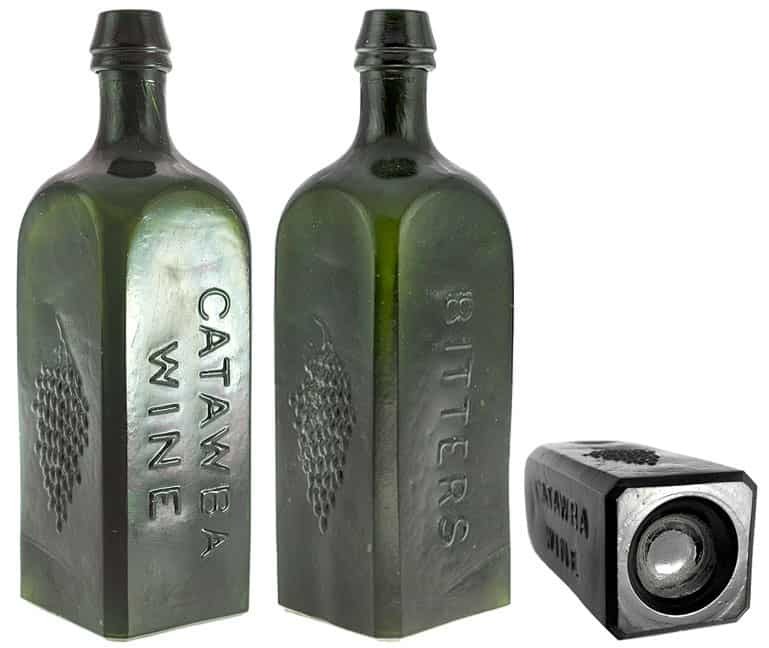 I would like to add that I can not say with 100% certainty that the Catawba Wine Bitters bottles that I have associated with Nicholas Longworth are correct but I am pretty darn sure. We will just have to wait until a labeled example is found. 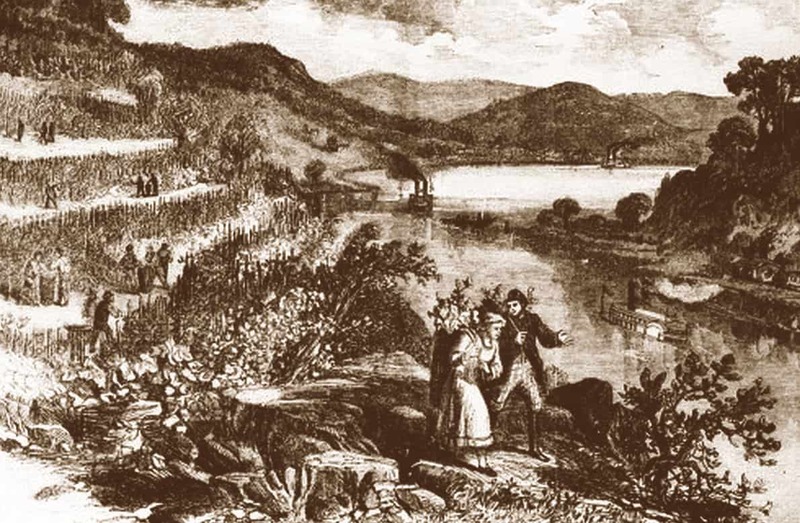 The popularity of Longworth’s wine encouraged a flurry of plantings along the Ohio River Valley and up north to Lake Erie and Finger Lakes region of New York. Longworth would also encourage artists to paint scenes of the Ohio River Valley, and the Ohio River Valley Wine Trail (formerly the Nicholas Longworth Wine Trail), in Southwest Ohio. In Cincinnati, the Taft Museum of Art on Pike Street now occupies the former residence of Nicholas Longworth. Considered a National Historic Landmark built around 1820 for prominent businessman Martin Baum, it is the oldest domestic wooden structure and is considered one of the finest examples of Federal architecture in the Palladian style in the country. Longworth, during his habitation of the mansion hired African American painter Robert S. Duncanson to paint landscape murals in the foyer, now considered as one of the finest suites of domestic murals dating from before the Civil War. Longworth supported Duncanson, America’s first famous black artist, as a mentor and financed the artist’s trip to Europe where he sold paintings to the Queen of England and other dignitaries. 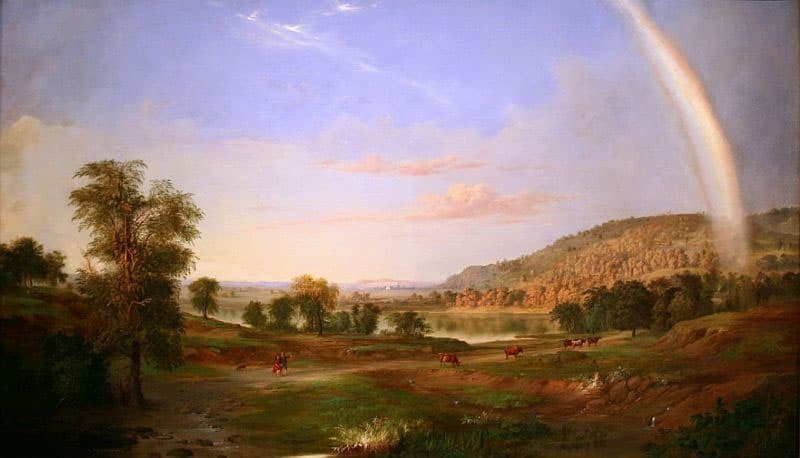 Landscape with Rainbow, 1859 is represented below. Longworth was also the great-grandfather of U.S. Congressman Nicholas Longworth IV (a United States House of Representatives from Ohio), and the grandfather of Civil War Union General Nicholas Longworth Anderson. 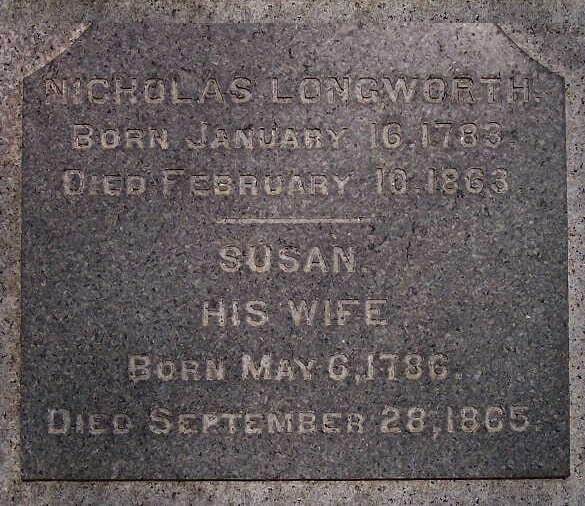 Nicholas Longworth would die on February 10, 1863 at the age of 80. At his death, his property was valued between $12 and $15 million dollars. Isidor Bush (or in Europe, Busch) has his name on the extremely rare Missouri IXL Bitters bottle which to me is quite amazing. 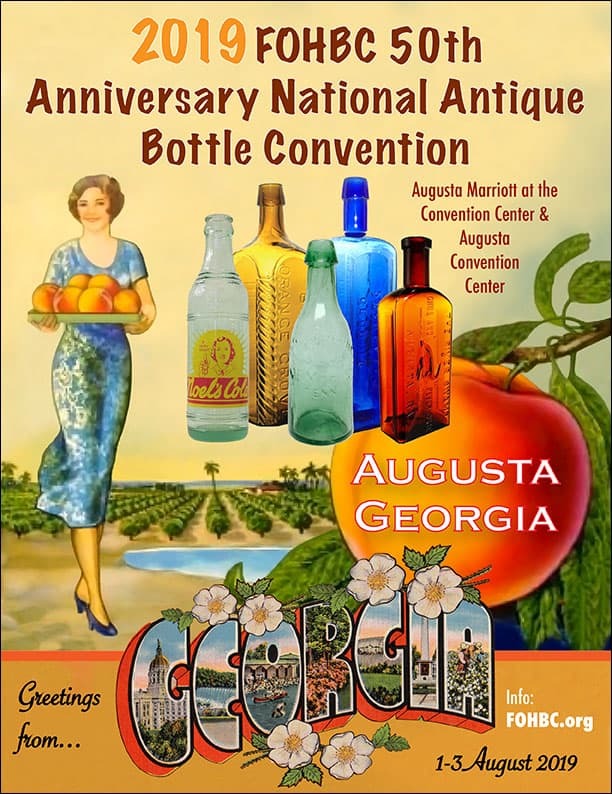 I’ve only personally seen this bottle once and that was at the FOHBC 2015 Chattanooga National Antique Bottle Show when bitters collector, Brad Shultis, carefully unwrapped the bottle to show me. The image at the top of the post was taken at the show. Actually, there is so much more to this bottle and the man behind it. 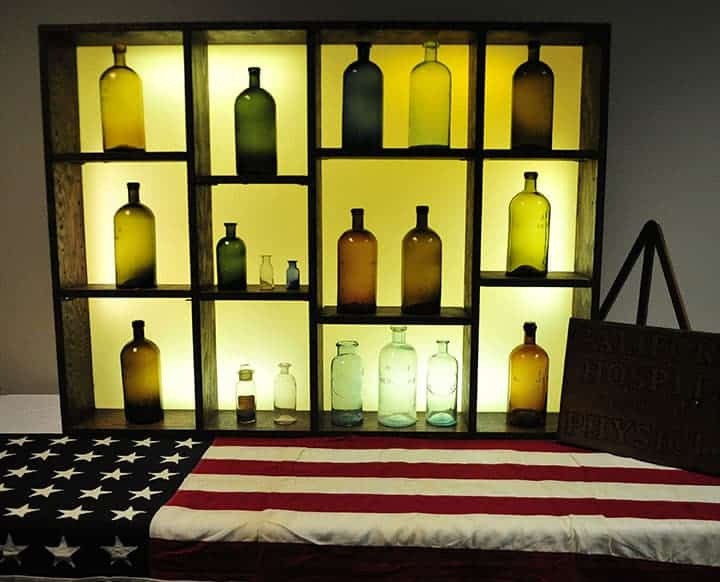 Example was dug in Pekin, Ill. with 1860s items. Name correctly spelled on bottle. Isidor Bush was born in the Prague, Bohemia on January 15, 1822. He was the great-grandson of Israel Honig Edler von Honigsberg, who was the first Jew raised to nobility in Austria. As a child, Isidor was favored by his father Jacob as his mother, Fredericka had died when he was only three years old. Isidor Bush was privileged and was able to surround and associate himself with many Jewish intellectuals while growing up. Bush was somewhat of a Renaissance man in that he was, among other things, an author, publisher, journalist, grocer, banker, railroad freight agent, politician, abolitionist, insurance agent, civic leader, philanthropist, capitalist, patriot, wine and liquor merchant, and a viticulturalist, one of the first grape growers and wine producers in Missouri. When Isidor was fifteen years old, he moved to Vienna and worked at Schmid’s Oriental Printing Establishment, which his father had acquired. At this young age, Bush became engrossed in the printing business and turned to the study of languages. Soon he could read and write in Greek, Latin and Hebrew along with his native German. For six years (1842–47), Bush edited and published the Kalendar und Jahrbuch für Israeliten among many other important works. Eventually, Bush became a partner and a leading book pioneer and publisher in Vienna and the firm was renamed Schmid and Busch. With the Austrian Empire Revolution in 1848, Bush had to flee to America and settled in New York City along with many other liberal Jewish intellectuals. He arrived on January 8, 1849 with his wife Theresa Taussig who he married in 1844 and their son Raphael. There Bush opened a store that sold newspapers and stationery. On March 30, 1849, Bush founded and published the first issues of Israel’s Herald, the first Jewish weekly in the United States which was patterned after the journal he had published in Vienna. Unfortunately, the effort failed financially, so Bush had to stop operations after only three months. 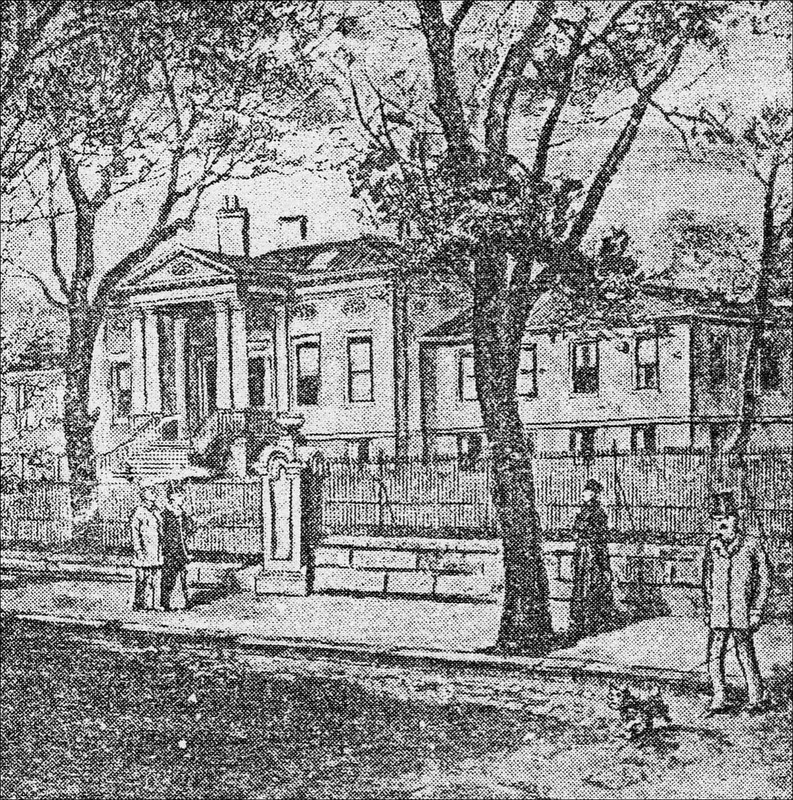 With little available funds, Bush moved to St. Louis, Missouri in the summer of 1849 where his wife’s family, the Taussig’s had settled. There Bush entered into partnership with his wife’s father Charles Taussig, in the firm of Bush & Taussig. They were one of the leading merchants in the city specializing in groceries and hardware located at Carondelet and Park Avenue. Bush and Taussig would run the general store successfully on the south end of St. Louis for many years. Isidor Bush became a naturalized citizen in 1854 and ardently opposed slavery and championed the Union cause. In 1857, Bush helped incorporate and was made president of the Peoples’ Savings Bank in St. Louis. In the late 1860s he was also president of the Mechanics Savings Bank, and later served as actuary for the German Mutual Life Insurance Company. When the Missouri Convention was called to determine whether the state should join in the secession movement, Bush was chosen a member on the Unconditional Union ticket, and was made a member of the Committee of Nine, to which most important matters were referred such as abolishing slavery and forming a new constitution. 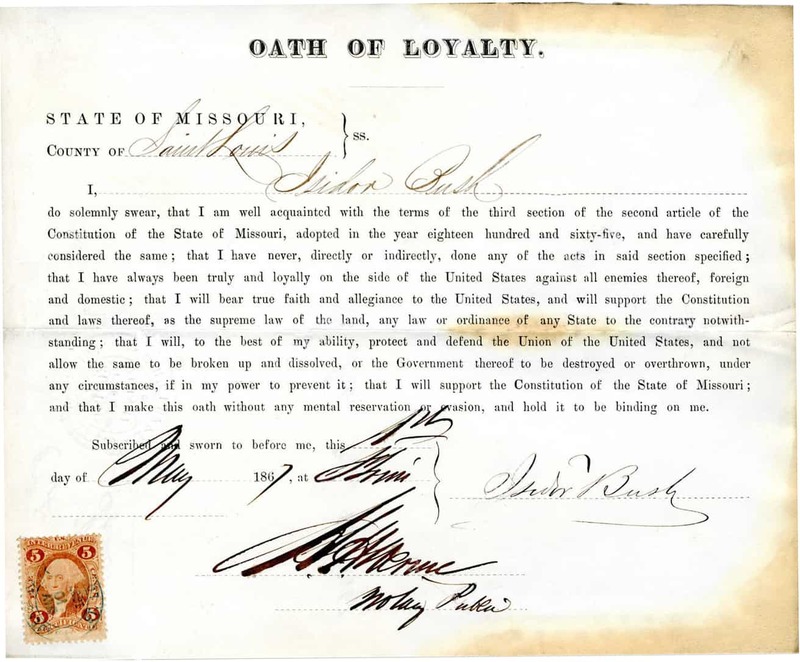 He was also elected a member of the Missouri state board of immigration to repair losses in population resulting from the war, which post he retained for twelve years. Despite many successful endeavors, Bush never really became a wealthy person in the traditional sense. He certainly suffered his share of financial setbacks but typically was able to rebound, take care of his debts and move on. He was always on the forefront of thought and innovation and prospered sufficiently to position him as a leader in the Jewish Community and the city of St. Louis. One of those associations that Bush was prominent in was the B’nai B’rith, the famous national Jewish fraternal and philanthropic organization. His achievements within the organization were substantial. Bush also served on the City Council and Board of Education in St. Louis as he held public education in high regard. Bush apparently suffered physical disabilities in a fire when he was a child that prohibited full military service, so he assisted the Union cause in other ways. When Gen. John C. Fremont (the Pathfinder) took command in 1861, with headquarters in St. Louis, Bush was made his secretary and aide-de-camp, with the rank of Captain. He submitted to Secretary of the Treasury, Salmon P. Chase a plan for a government loan of one hundred million dollars, similar to the famous Rothschild premium loans of Austria. Chase feared its rejection by Congress, but was impressed with Bush’s financial genius, and offered him a Treasury clerkship. Bush refocused after the Civil War back to St. Louis, and became for six years the auditor and general freight and passenger agent for the St. Louis and Iron Mountain Railroad Company. 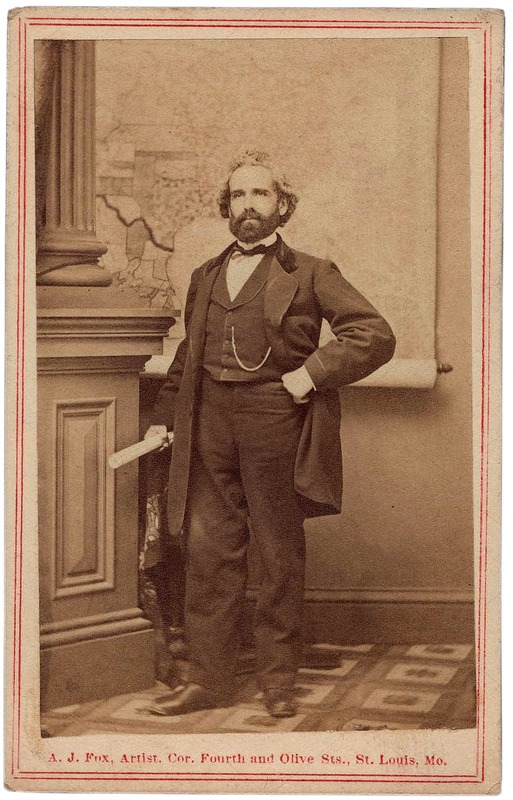 He later would become director of the railroad, serving until 1865 when the line was taken over from New York by financier Jay Gould and the State foreclosed its liens on the railroad. Next, Bush partnered in the real estate firm of Barlow, Valle & Bush. Interesting enough, Bush was able to purchase many tracts of land south of the city in Jefferson County that were next to the railroad tracks and Mississippi River. The first tract was purchased in February and March 1865 and included 241 acres near the present-day town of Pevely. He had become familiar with this land during his years with the Iron Mountain Railroad. This land was ideal as his research assured him that the land was adaptable for growing grapes and fruits while having an excellent steamboat landing. Owning this land would play out as Bush became interested in wine-making and created the Isidor Bush Wine Company. He called all his land “Bushberg,” which of course he named after himself. The image above shows the town of Bushberg facing the river in 1880. It was at one time a thriving community complete with steamboat landing, railroad station, post office, wood yard, hotel and a saloon. The image below shows the Isidor Bush house. 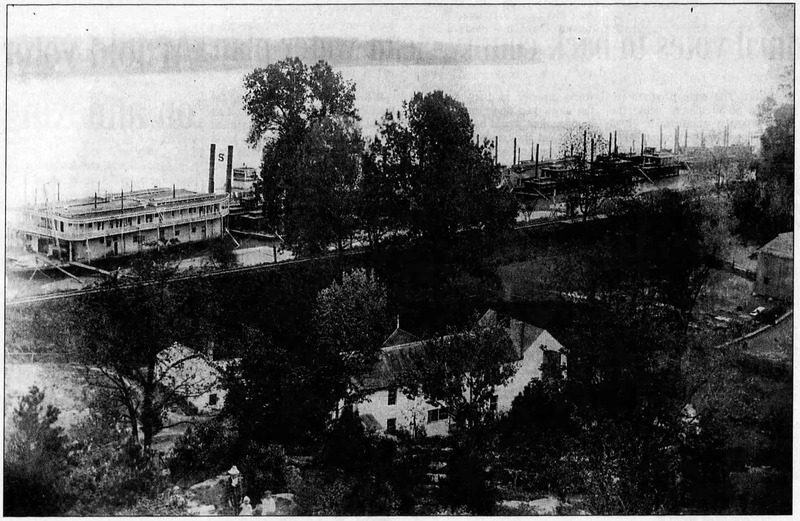 Both images courtesy of the Missouri Historical Society. Bush even had the foresight to send his son Raphael to apprentice with viticulturalists in Hermann, Missouri and Cincinnati, Ohio to learn the trade. 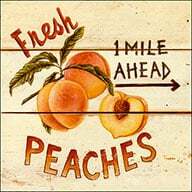 Their grocery business had suffered during the Civil War and the senior Bush wanted to spare his son from the whims of commercial life. He also felt that agriculture was a more noble Jewish pursuit. By 1868, the vineyard had nine acres with 20 varieties of grapes. That year the vineyard purchased the post office to handle its growing mail-order business as the company was extremely successful in raising grapes and became known for its products. Before long, Bush was considered a leading expert in viticulture. 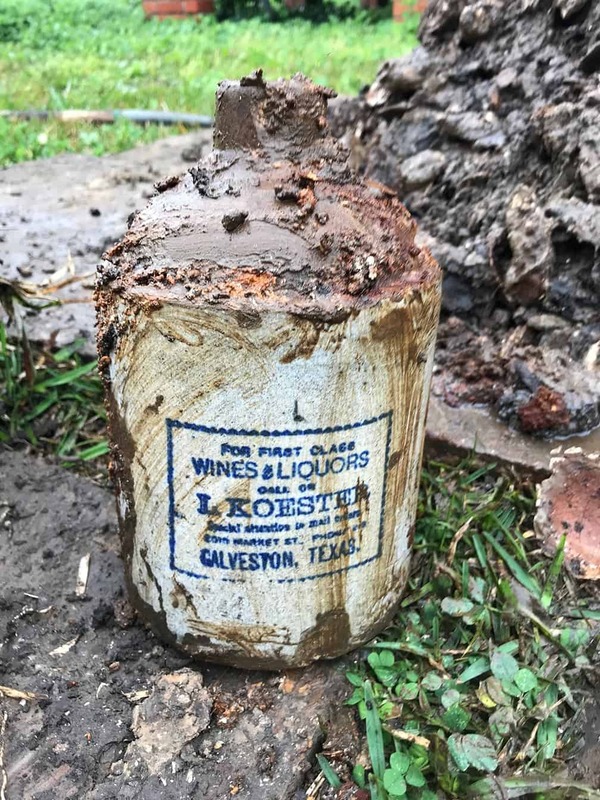 He even sent large quantities of cuttings from his vineyards to France to replace the ravages there by phylloxera as his wild American vines had a greater resistance to the root louse. In 1871, Bush hired Gustavus E. Meissener who was operating a nursery in Waterloo, Iowa to become his foreman at Bushberg. He would eventually become a partner in the wine growing and vineyard business. You can see his name on the catalogue below. 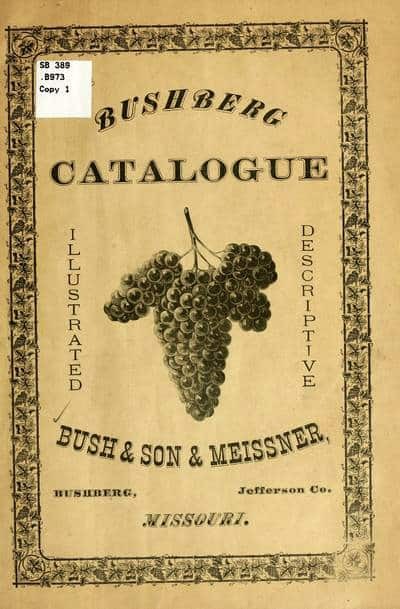 Bush, after years of preparation, published his first catalogue of grapes in 1869-70 called the Illustrated Descriptive Catalogue of Grape Vines, Small Fruit and Seed Potatoes. 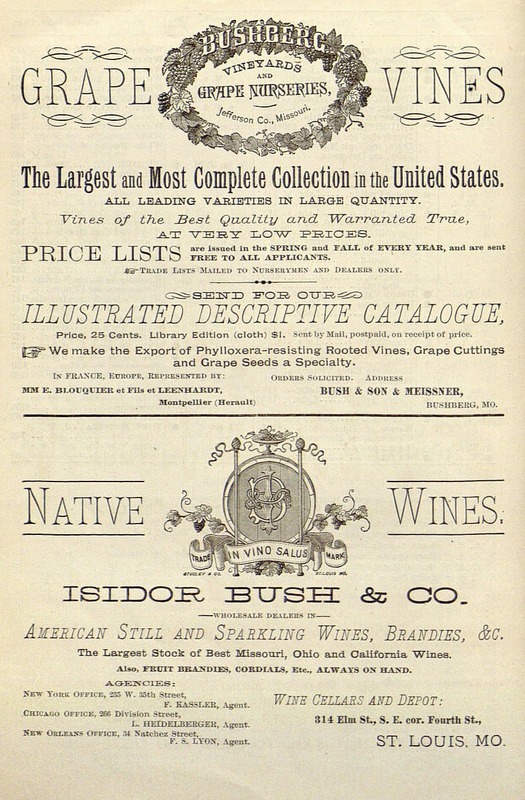 The vineyards’ reputation had spread in the 1870s so The Bushberg Catalogue evolved and only focused on grapes. This catalogue went through a number of generations and was translated into several languages with international acclaim. The catalog contained two major sections. The Grape Manual’ contained a history of grape culture and the latest information about grape growing, and the ‘Descriptive Catalogue’ described and listed native varieties, histories and characteristics. 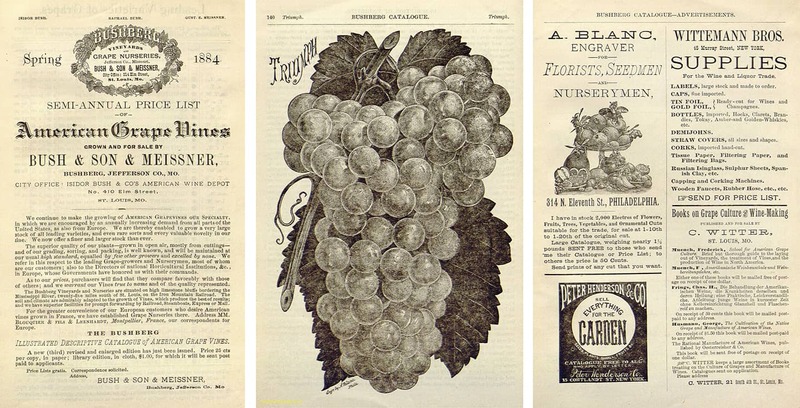 Later editions included testimonials from prominent grape growers, horticulturalists and agriculture official plus related advertising to the trade. 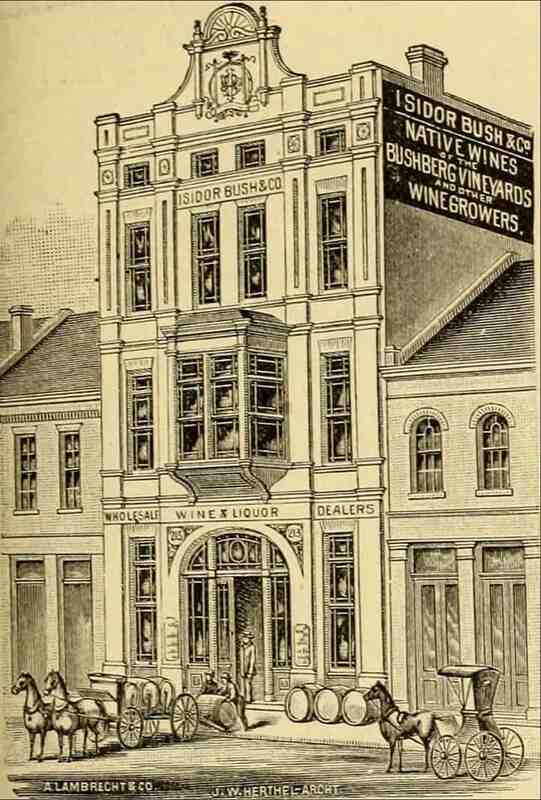 In 1870, Bush and his son Raphael organized the firm of Isidor Bush & Son to run the wholesale and retail trade which grew into one of the most successful wine and liquor enterprises in St. Louis. Their primary address was 314 Elm Street. 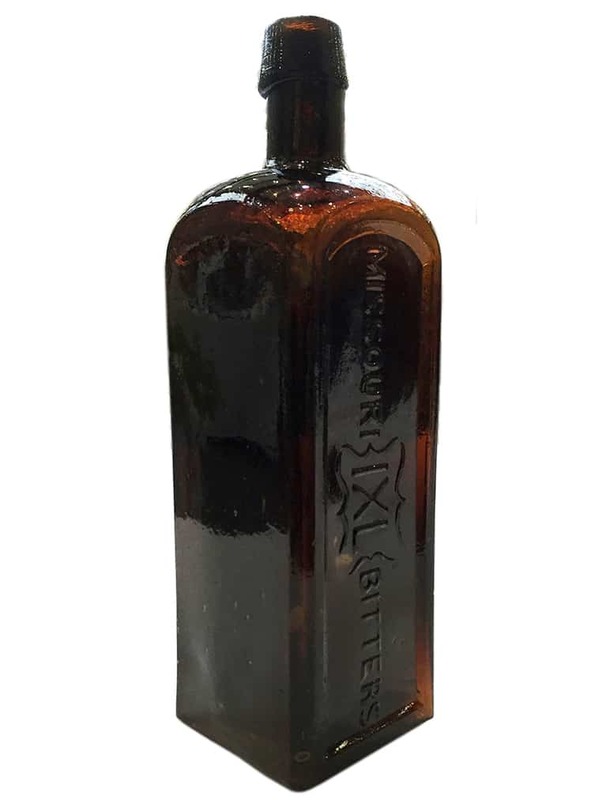 It was during this period that the Missouri IXL Bitters was produced. I have only seen one example. I believe it was dug in Pekin, Illinois before it came to its present owner. The northern California wine business was rapidly growing by the end of the 1800s and impacted the Bush wine business. There seemed to be less demand for his vines and his research. 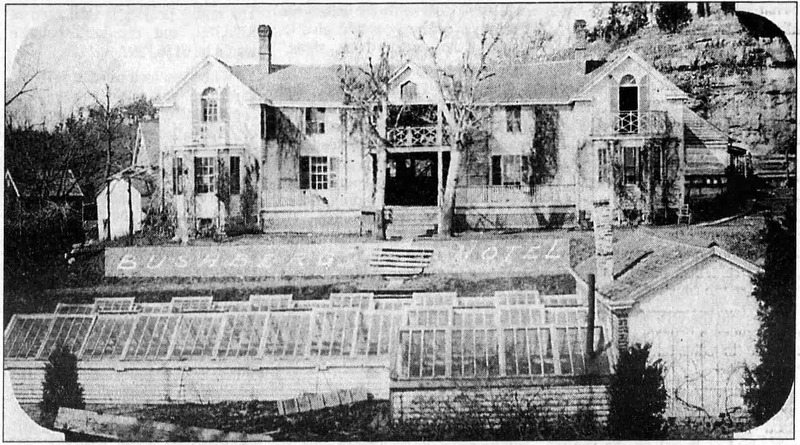 The vineyard would close in 1895. The town of Bushberg would cease to exist. 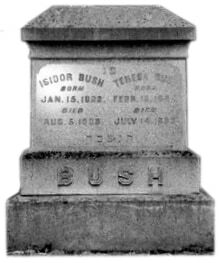 Isidor Bush died in St. Louis on August 5, 1898 and is buried in Bellefontaine Cemetery. His wife Theresa had previously died in 1893. Isidor Bush was a admired person and was considered one of St. Louis’s finest citizens. He also had his name on a bitters bottle. 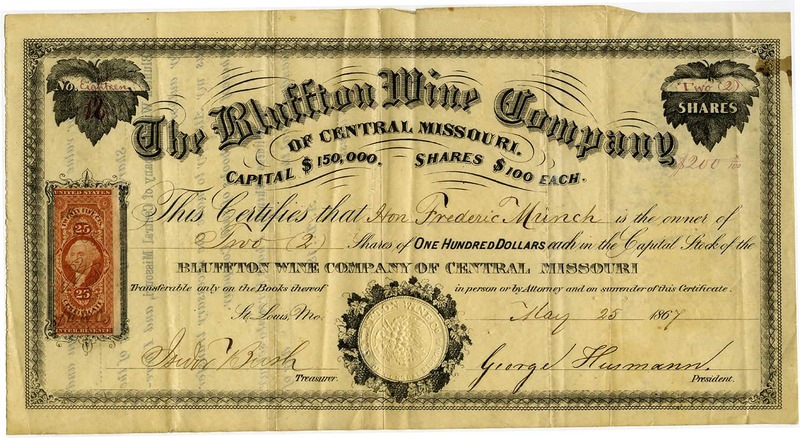 Stock certificate for $200 of stock of Frederic Munch [Friedrich Muench] in the Bluffton Wine Company, signed by Isidor Bush and George Husmann, May 25, 1867 – Muench Family Papers, Missouri History Museum Archives, St. Louis, Missouri. Did you know that Garry Owen Strengthening Bitters was named after an Irish tune for drinking and a quickstep dance? The song was selected as a marching tune for American military formations, including General George Armstrong Custer’s 7th Cavalry Regiment. Listen to Tune. Isaac Lazarus Lyons was born in 1837 and educated in Columbia, South Carolina. 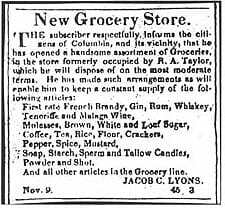 His father was Jacob C. Lyons who would open and run a successful grocery store in Columbia in 1827. The business earned its reputations as an oyster saloon for students from South Carolina College. 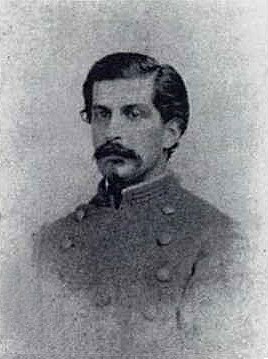 Isaac would spend his childhood in Columbia moving to New Orleans just before the outbreak of the Civil War. He enlisted in the Confederate Army as a private, saw a great deal of service and was later promoted to Captain. 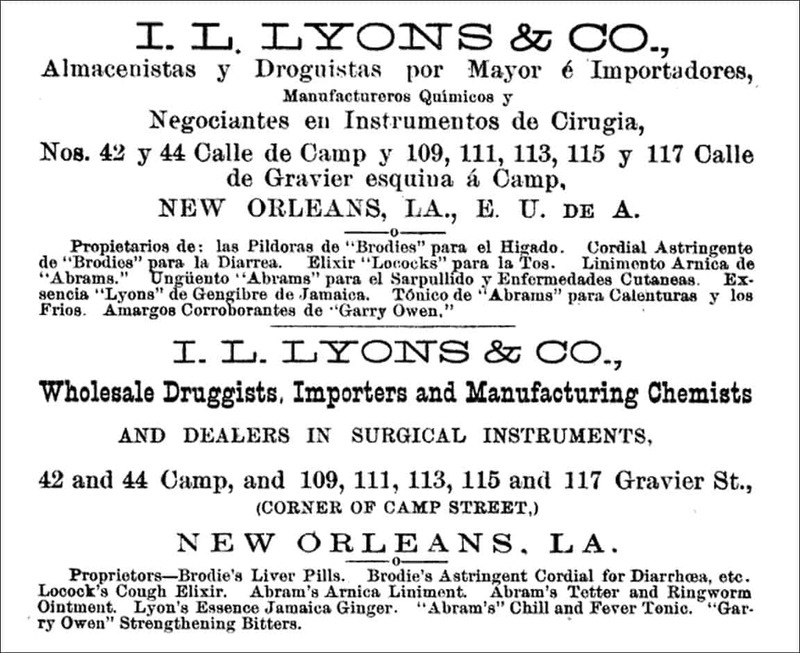 After the war, Lyons returned to New Orleans and in 1866 engaged in the wholesale drug business under the firm name of Tucker & Lyons. 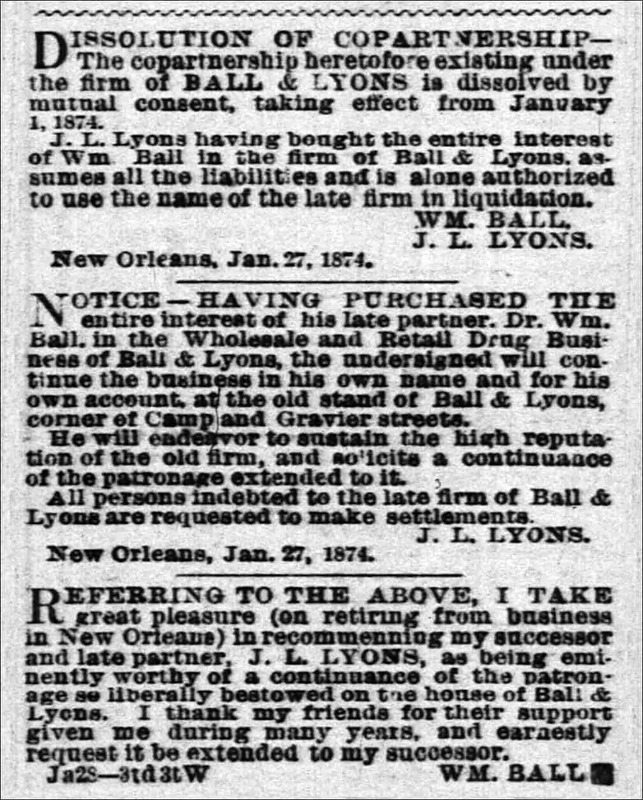 In 1867, Ball, Lyons & Co. formed when Joseph Tucker retired disposing of his interest to William Ball, late of Wheelock, Finlay & Hall. 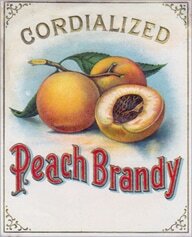 By 1869, Ball, Lyons & Co. was run by partners, William Ball, Isaac L. Lyons and W.H. Dashiell. 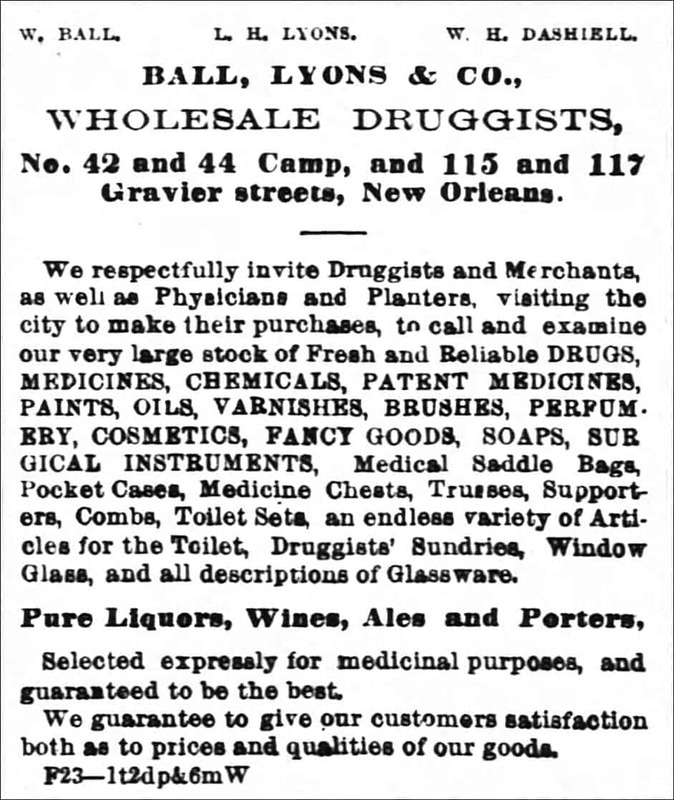 They were listed as wholesale and retail druggists located at 42 and 44 Camp, and 115 and 117 Gravier Streets in New Orleans, Louisiana. They carried a large stock of drugs, medicines, chemicals, patent medicines, paints, oils, varnishes, brushes, perfumery, cosmetics, fancy goods, soaps, surgical instruments, window glass, glassware etc. 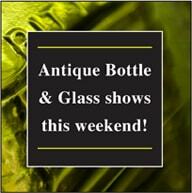 plus pure liquors, wines, ales and porters. They really had quite an operation. I. X. 7. X. 69. 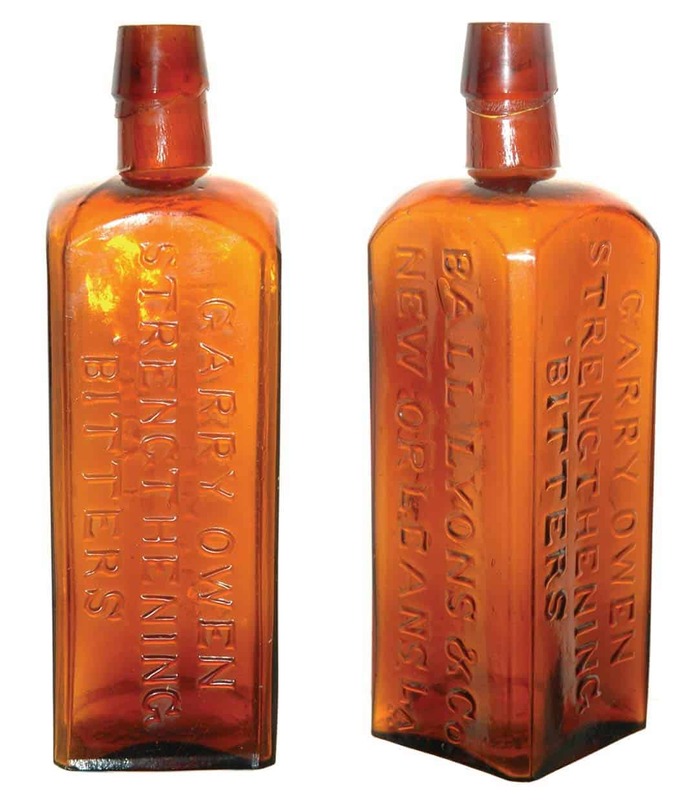 1869 is also the first year we see advertising for the celebrated Garry Owen Strengthening Bitters which is usually accompanied by the cryptic typography, I. X. 7. X. 69 which I suspect is a reference to the bitters inception date and maybe the 7th Calvary. 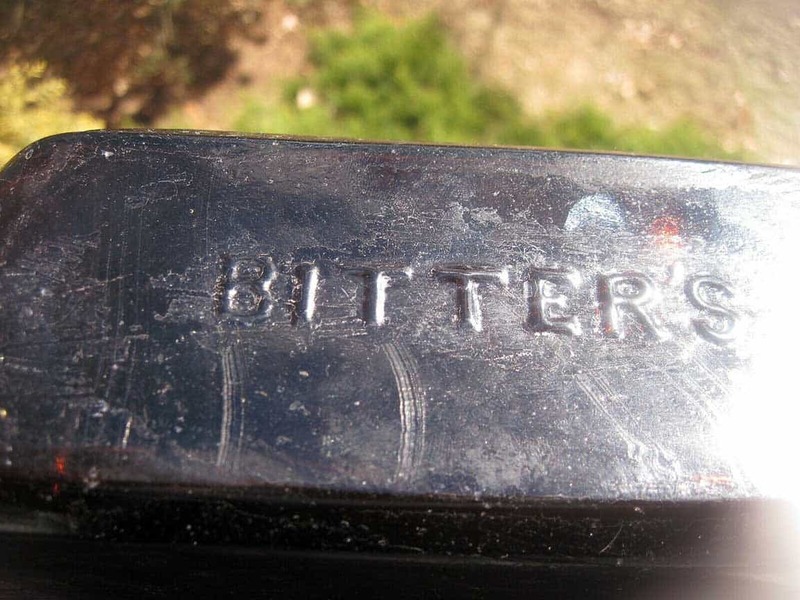 The bitters were advertised as being manufactured at home from the best and purest materials based on Peruvian Bark. 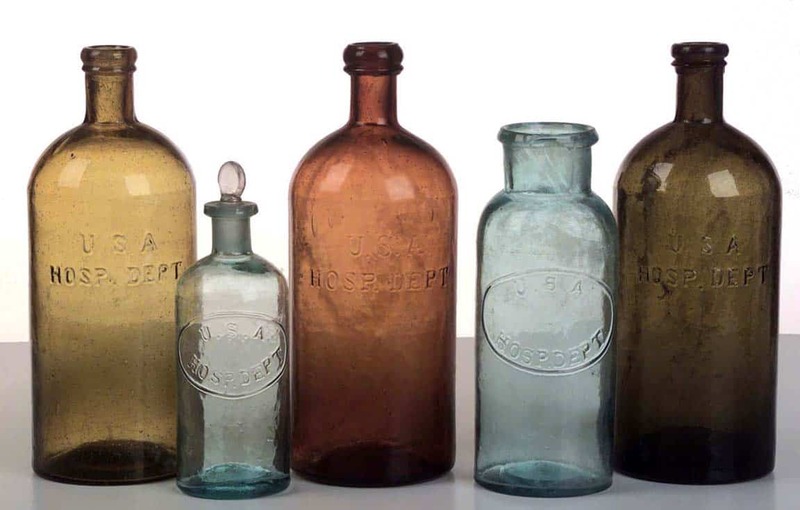 The bitters was directed to travelers, pioneers, miners, sea-going men, pilots and all persons navigating rivers, lakes and bayous and for persons living on the same as they may inhale the fog which was injurious to the nervous system of man. The bitters was said to be a sure preventative and cure for swamp fevers, bowel complaints and that it would cure the bites of serpents or venomous insects. 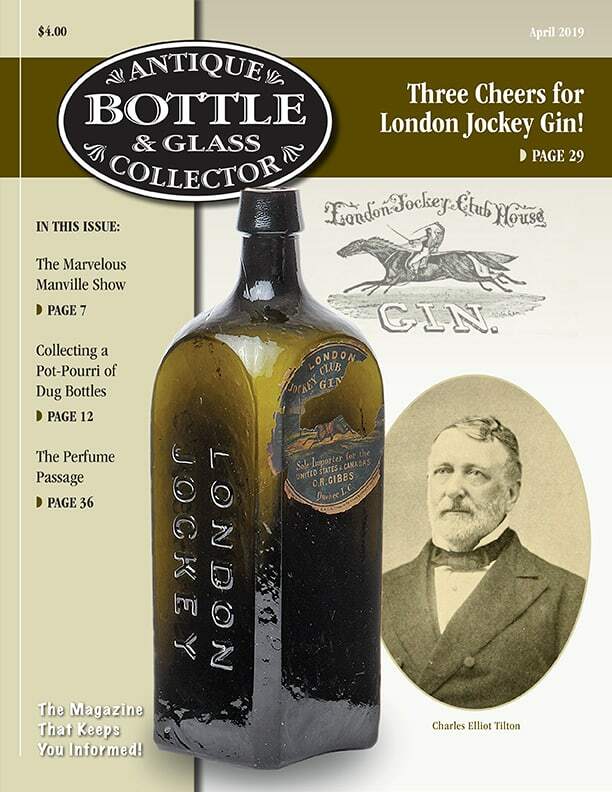 It was also particularly recommended to females as a mild, agreeable, strengthening tonic. Of course it was said to cure a number of other afflictions such as dyspepsia, indigestion, liver complaint, jaundice, nervous debility, chronic diarrhea, scrofula, ulcers, spinal diseases and all diseases arising from derangement, oil the liver, impurity of the blood or affection of the intestines or kidneys. Basically, the bitters would fix any problem. 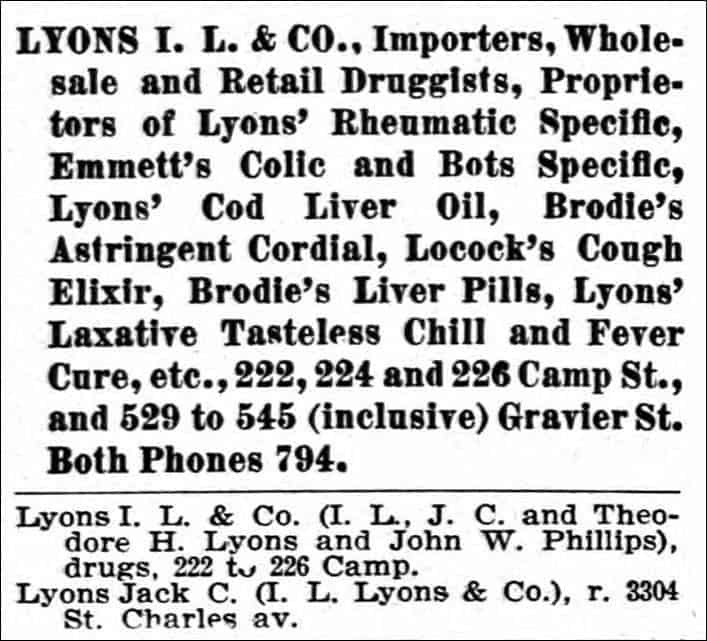 Ball, Lyons & Co. were also listed as the proprietors of Pure Cod Liver Oil, Essence of Jamaica Ginger, Flavoring Extracts, Nectar Syrup, Abraham’s Tetter and Ringworm Ointment, Abram’s Compound Arnica Liniment and Abram’s Southern Vegetable Chill Tonic. 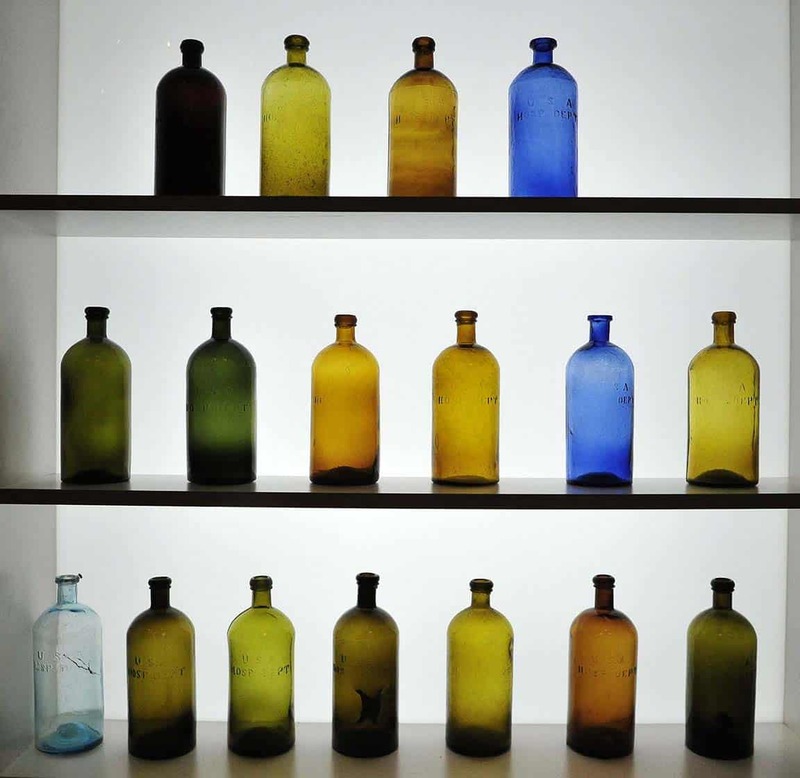 They also represented Dr. Benjamin Brodie’s Astringent Cordial, Dr. Lecock’s Cough Elixir, Abram’s Compound Concentrated Fluid Extract of Buchu, Abram’s Compound Fluid Extract of Sarsaparillsa with Iodine of Potassium and Elixir of Calisaya and Iron. 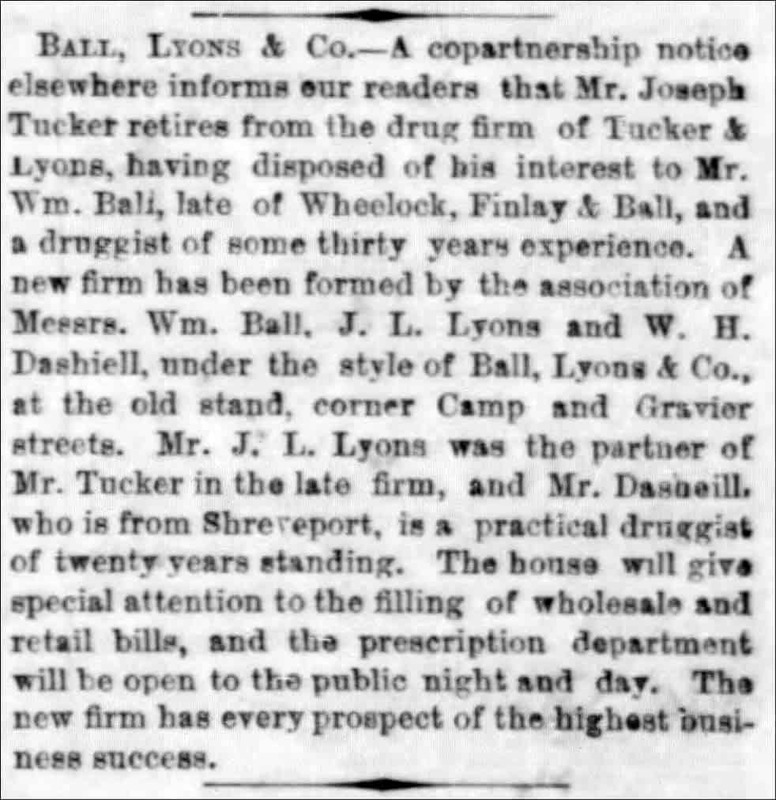 In 1874, the partnership between Ball and Lyons ends and I. L. Lyons & Co. is announced as the successor to Ball, Lyons & Co. 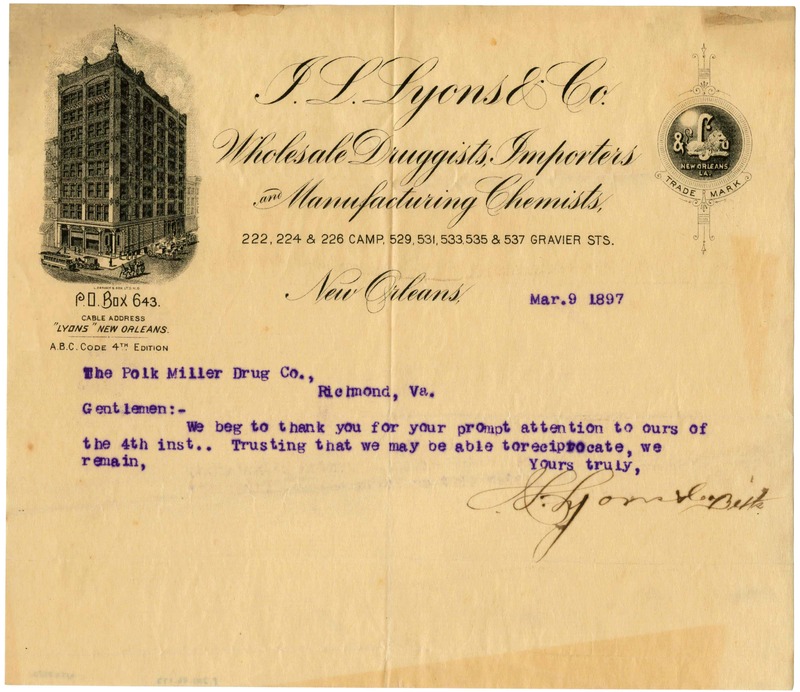 They remain at the corner of Gravier and Camp Streets and were listed as wholesale druggists and manufacturing chemists. They would operate for decades with great success as the images below indicate. 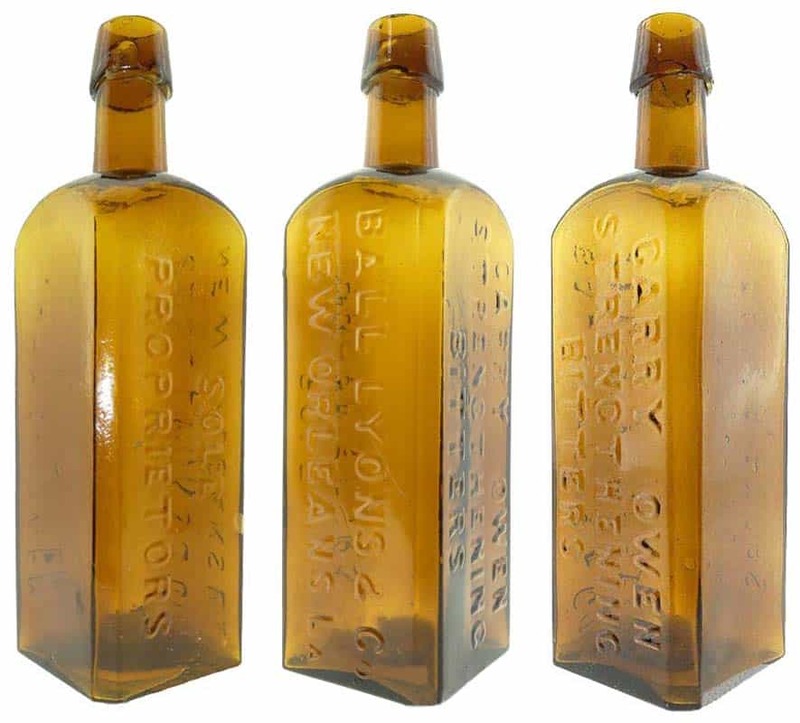 Isaac L. Lyons began selling his nectar syrup to K & B Drugstores in the 1880s, who made it into nectar sodas, nectar cream sodas, and nectar ice cream sodas at their fountains. 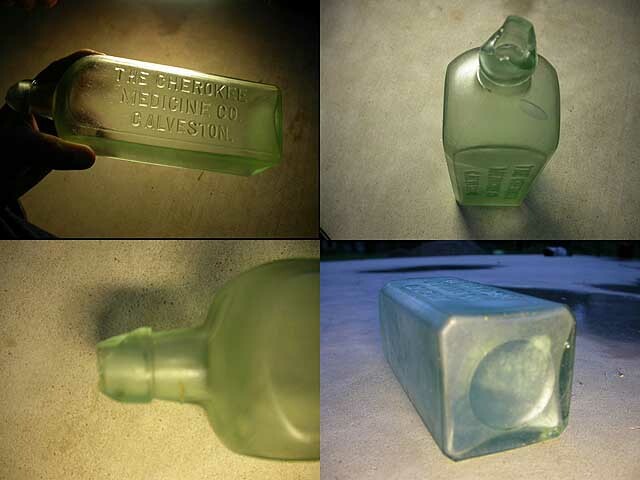 As in Cincinnati, this became a very popular flavor and other drugstores – Schweighardt’s, Bradley’s, Berner’s, and Walgreen’s – bought the syrup from Lyons and served this flavor. By the turn of the 20th century nectar sodas were a signature flavor of New Orleans. Isaac L. Lyons was very prominent in New Orleans and was identified with many charitable and civic movements in his home city and was a member of the first board of control of the National Wholesale Druggists Association in 1882. He was at one time a director of Kingsley House, and was connected for a long time with the child welfare movement. He was a member of the Chess, Checker and Whist Club, the Boston Club and the Country Club. Isaac L. Lyons would die after a prolonged illness at 86 years old on November 14, 1923 at his residence on 2344 St. Charles Avenue. 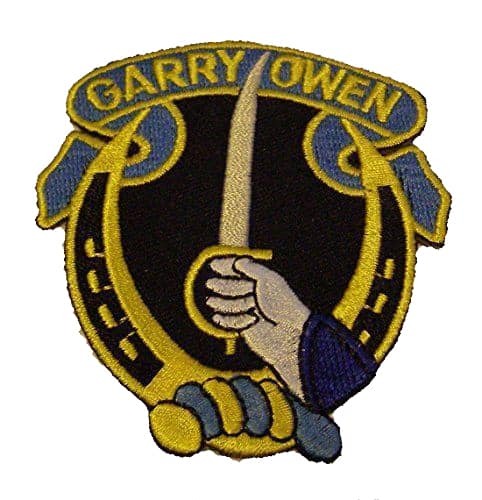 Garry Owen was the marching song for Custer’s Seventh Cavalry.